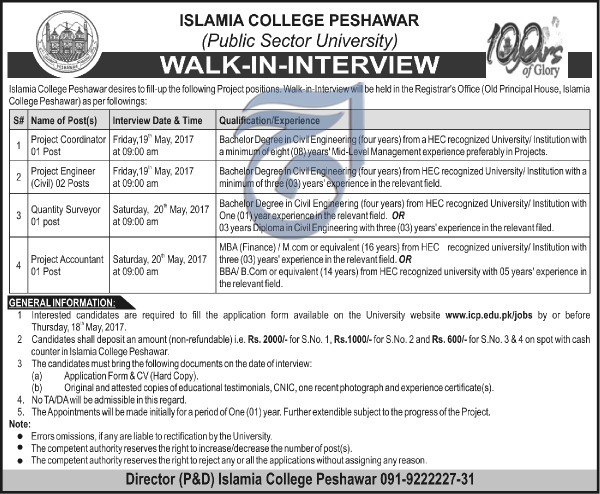 18-10-2017 Daily Aaj UNIC country director visit to Islamia College, Peshawar. 19-08-2017 Daily Aaj MPhil / PhD admission open for the Session 2017. 21-06-2017 Daily Aaj PhD Scholar Jahanzeb Shaor successfully completed his PhD from Department of Urdu. 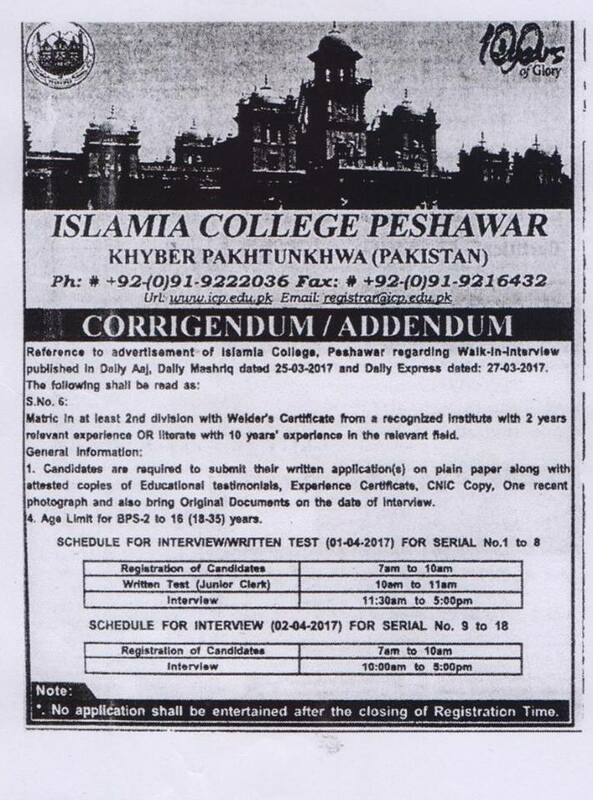 21-06-2017 Daily Aaj 50 Million Rupees released to Islamia College for community development center, approved by Prime Minister of Pakistan. 07-06-2017 Daily Aaj MPhil Scholar Ms. Seema Noor completed her degree in Urdu. 07-06-2017 Daily Aaj MPhil Scholar Ms. Shagufta Afridi completed her degree in Botany. 15-05-2017 Daily Aaj Pashto Annual Day, 2017. 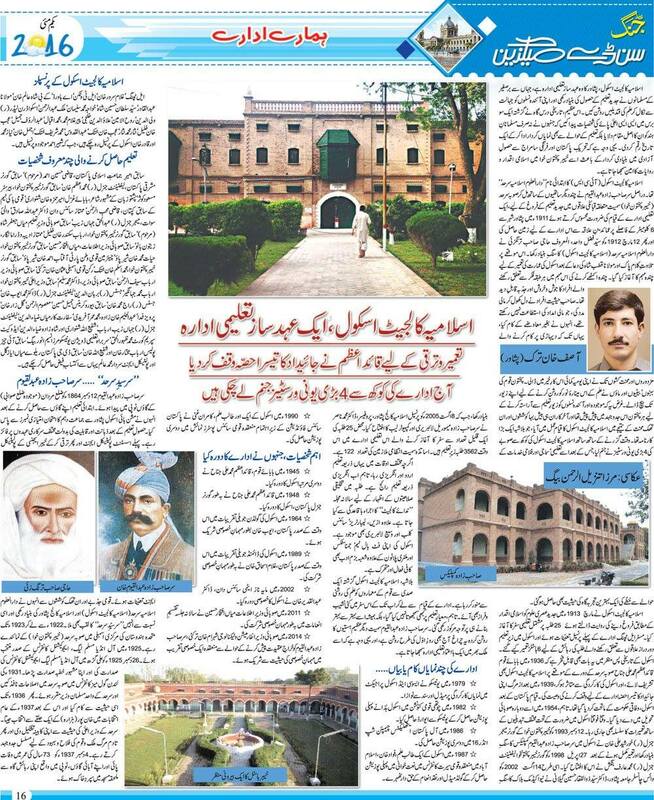 03-04-2017 Daily Aaj Feature article about Islamia College, Peshawar Published in Daily Aaj. 28-03-2017 Daily Express Corrigendum/Addendum advertisement published on 25-03-2017. 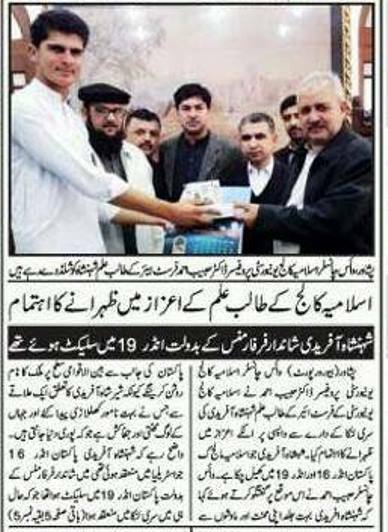 16-02-2017 Daily Express Prof. Dr. Habib Ahmad Vice Chancellor ICP, Presenting shield to Shaheen Shah afridi, student of Islamia College Peshawar, selected in under 19 cricket team. 08-02-2017 Daily Aaj CDWP approved 1545 Million Rupees for the establishment of IT industrial Center in Islamia College, Peshawar. 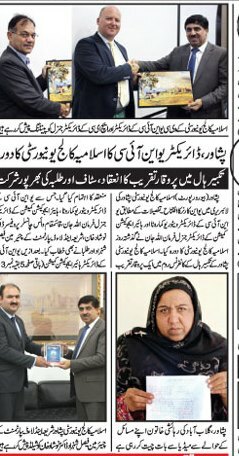 07-01-2017 Daily Aaj Honorable Vice Chancellor Prof. Dr. Habib Ahmad(TI) presenting shield to Secretory Social Welfare. 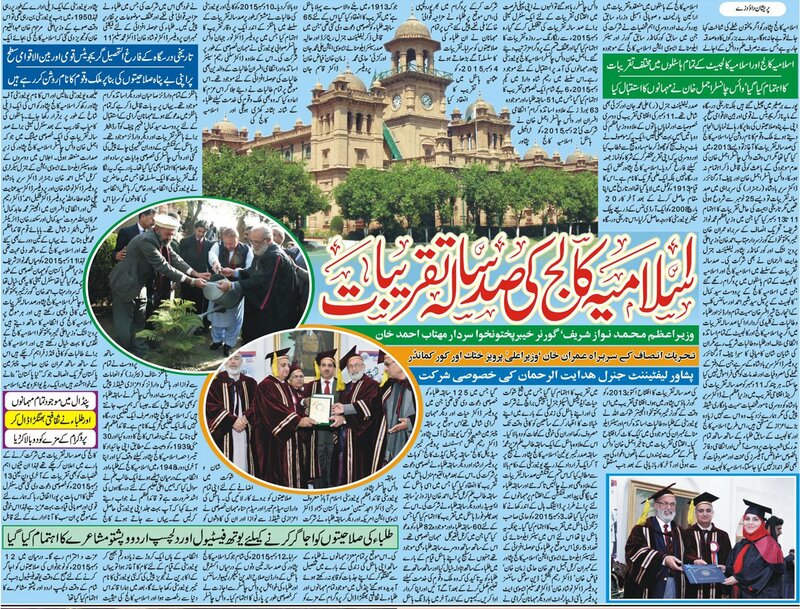 2016-12-20 Daily Aaj 4th Convocation of Islamia College Peshawar. 12-12-2016 Daily Aaj Welcome and farewell party to Vice Chancellor Prof Dr Habib Ahmad and Ex Vice Chancellor Mr Ajmal Khan, by teaching staff association. 30-11-2016 Daily Aaj Notification of grant of BPS-17 to Superintendent in different departments. 25-11-2016 Daily Aaj Various Tender Notice by Directorate of Works. 25-11-2016 Daily Aaj MPhil Scholar Sumiara Shah group photo with Vice Chancellor Prof. Dr. Habib Ahmad and Dr. Siraj U Din. 09-11-2016 Daily Aaj One Day seminar organized by Department of Law & Shariah. 05-11-2016 Daily Aaj Legend Test Cricketer Jalala Udin visit Islamia College, Peshawar. 25-10-2016 Daily Express Meeting of the Senior Alumni Association held in Islamia Collage, Peshawar. 24-10-2016 Daily Aaj Vice Chancellor Prof. Dr. Habib Ahmad (TI) and Prof. Dr. M.Rasool Jan presenting a shield to the Chairman HEC. 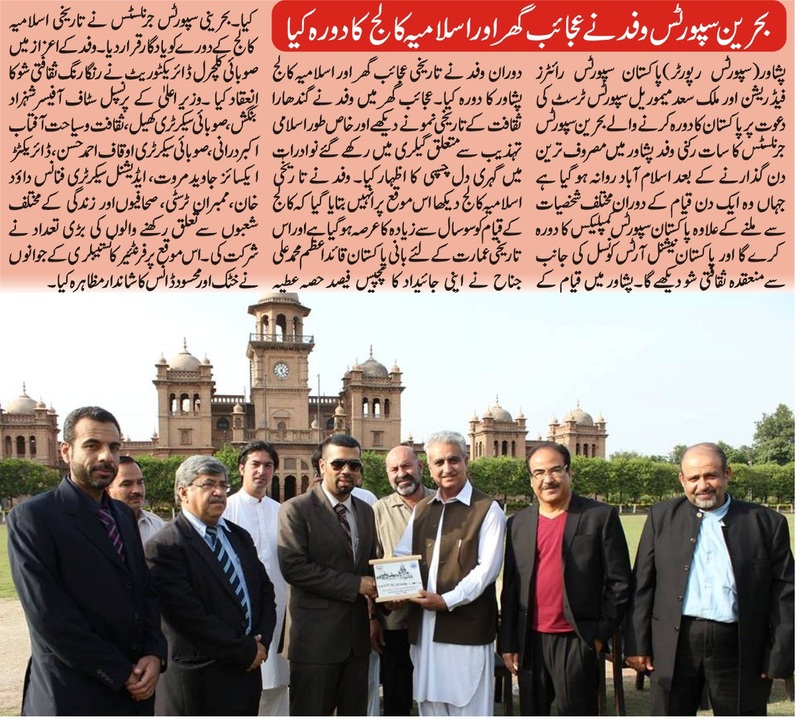 18-10-2016 Daily Aaj Legend cricketer Muhammad Yousaf visit Islamia College, Peshawar. 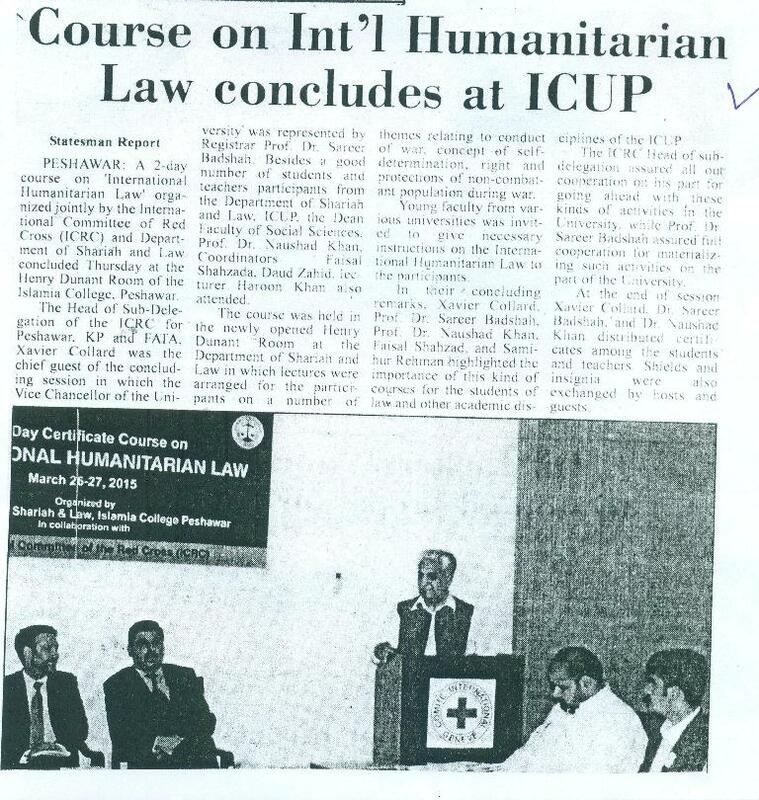 18-10-2016 Daily Awsaf Feature article of Vice Chancellor Porf. 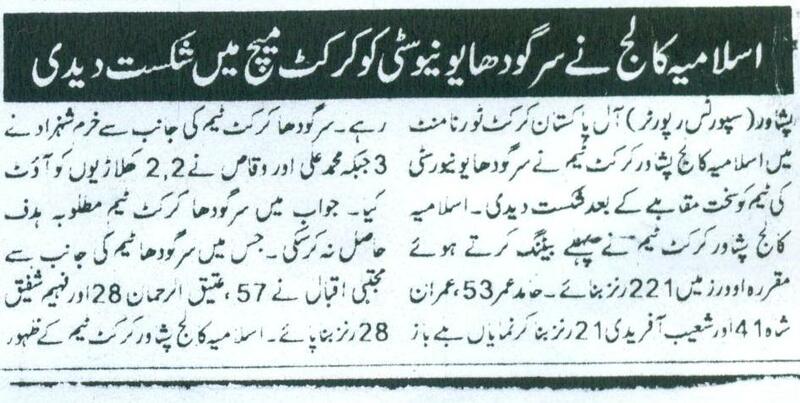 Dr. Habib Ahmad (TI) published in Daily Awsaf. 12-10-2016 Dawn Vice Chancellor Prof. Dr. Habib Ahmad sign MOU between International University of Kyrgyzstan and Islamia College, Peshawar. 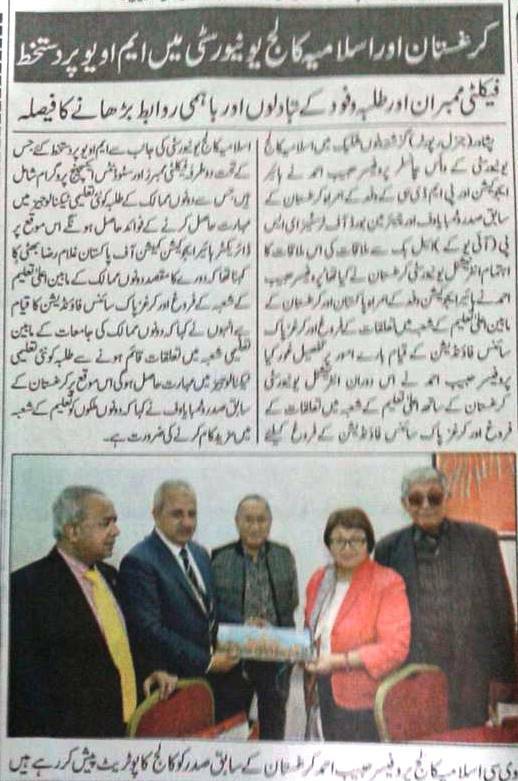 12-10-2016 Daily Express Vice Chancellor Prof. Dr. Habib Ahmad sign MOU between International University of Kyrgyzstan and Islamia College, Peshawar. 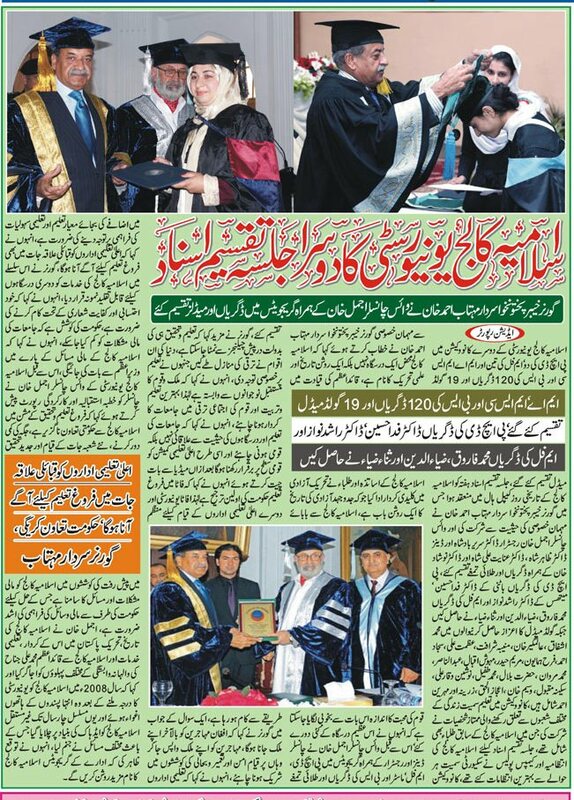 29-09-2016 Daily Awsaf Feature article regarding commencement of Academic year 2016 of Islamia College, Peshawar. 29-09-2016 Daily Awsaf Vice Chancellor Habib Ahmad (TI) delivered a lecturer in connection of lecturer series organized by Department of Statistics. 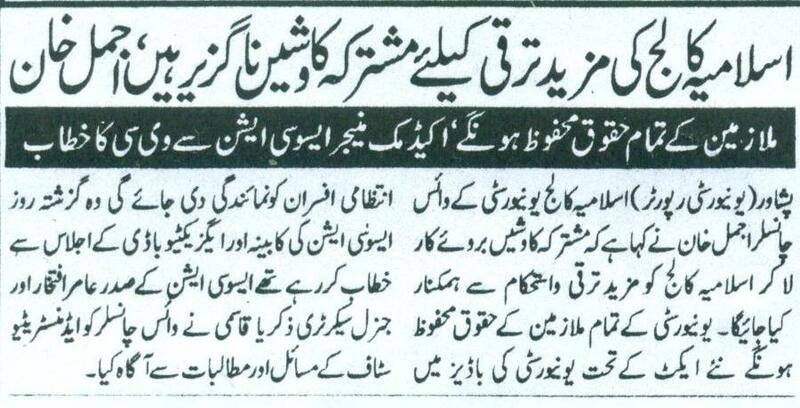 29-09-2016 Daily Aaj Vice Chancellor Habib Ahmad (TI) committed to regularize adhoc positions. 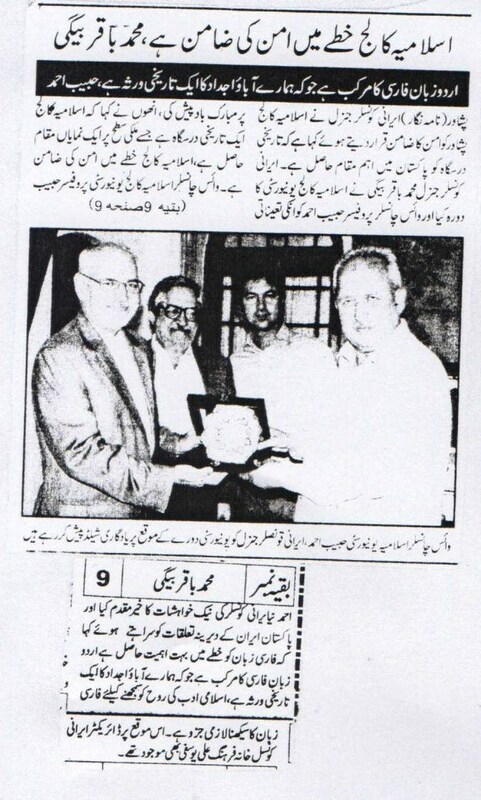 28-09-2016 Daily Mashriq Prof. Dr. Habib Ahmad (TI) presenting shield To Dr. Sher Muhammad. 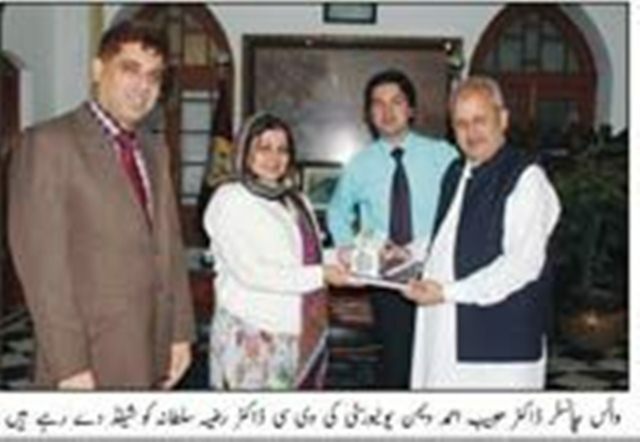 28-09-2016 Daily Mashriq Iran Embassy Counsel ate General Visit Islamia College, Peshawar. 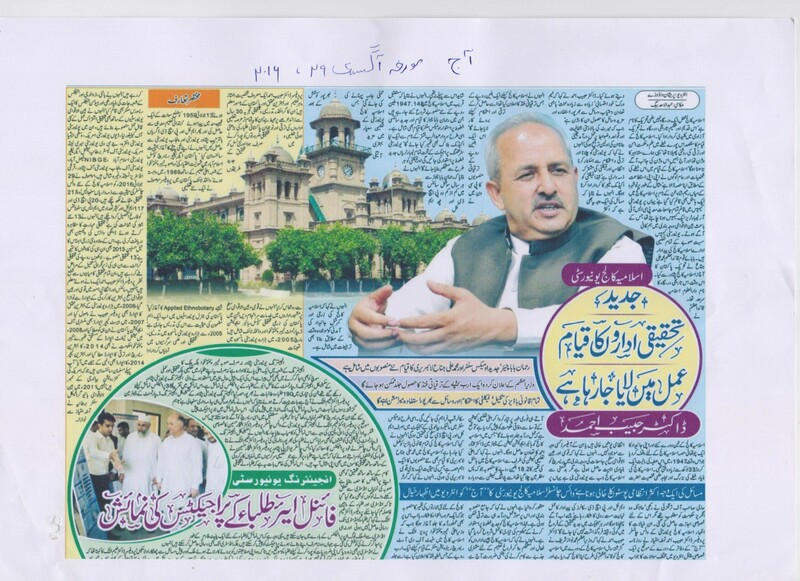 29-08-2016 Daily Aaj Vice Chancellor Prof. Dr. Habib Ahmad (TI) article published in Daily Aaj regarding the progress of Islamia College, Peshawar. 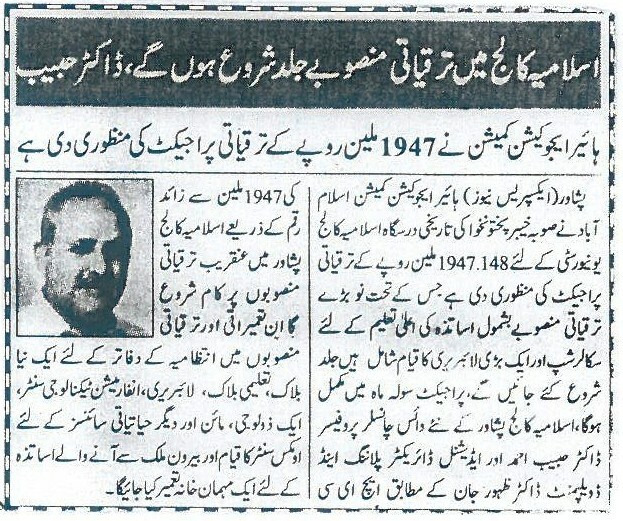 1947 Million Rupees Development Project Approved By HEC for Islamia College, Peshawar. 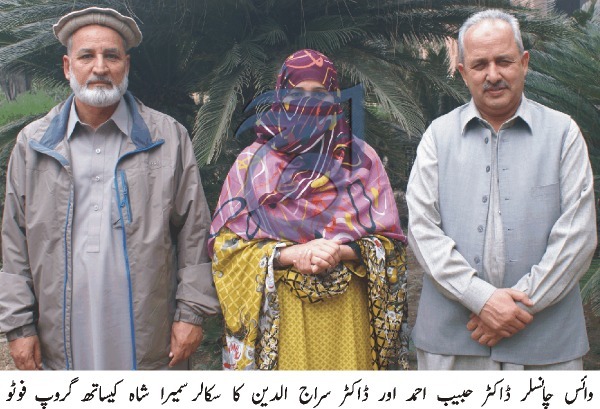 24-08-2016 Daily Aaj MPhil Scholar Ruqia Bano Completed her Degree. 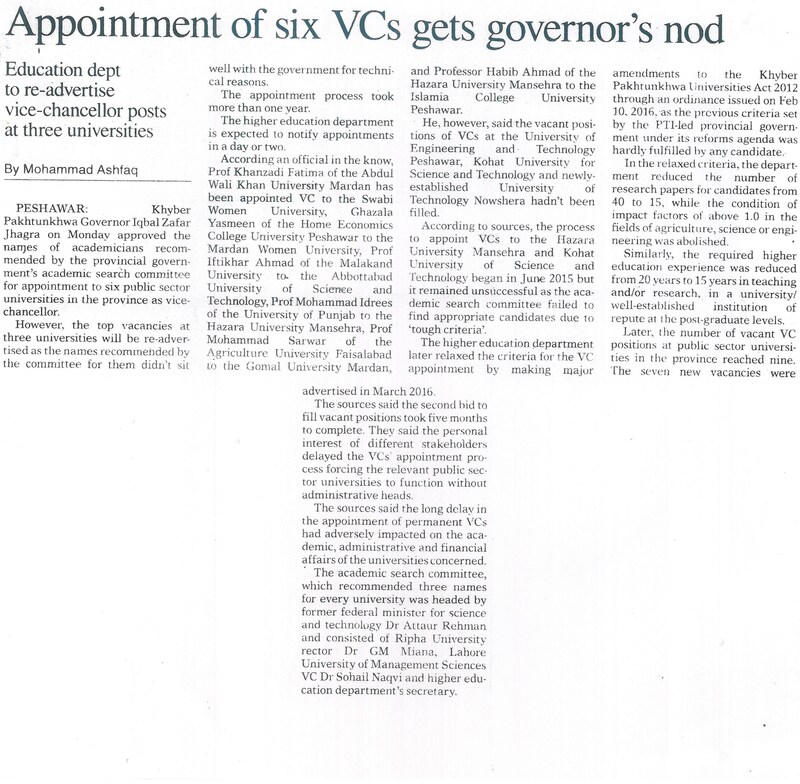 26-07-2016 Dawn Appointment of six VCs Gets governer approval. 23-07-2016 Daily Express Notification regarding Students Parents Coordination Council. 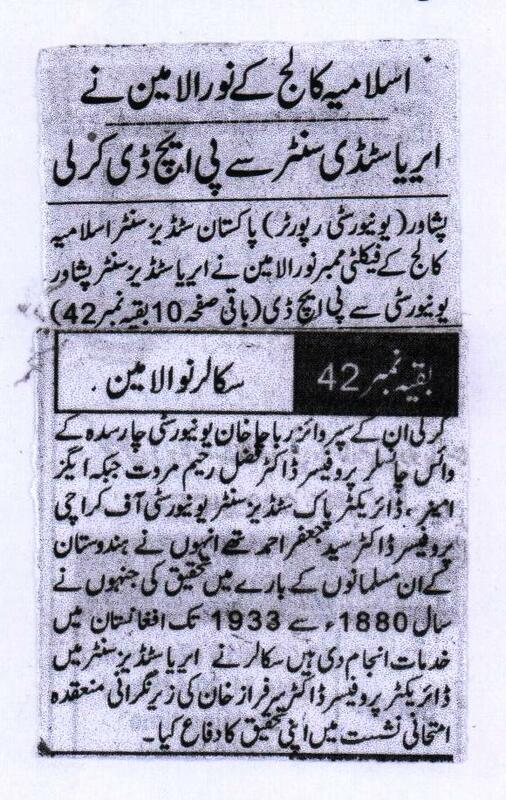 24-06-2016 Daily Express Prof. Dr. Naushad Khan appointed as Acting Vice Chancellor of Islamia College, Peshawar. 20-06-2016 Daily Aaj F.A/F.Sc/F.I.Th Session 2016-17 admission notice. 08-06-2016 Daily Aaj MPhil Scholar Mujeb Khan completed his degree from Department of Statistics Islamia College Peshawar. 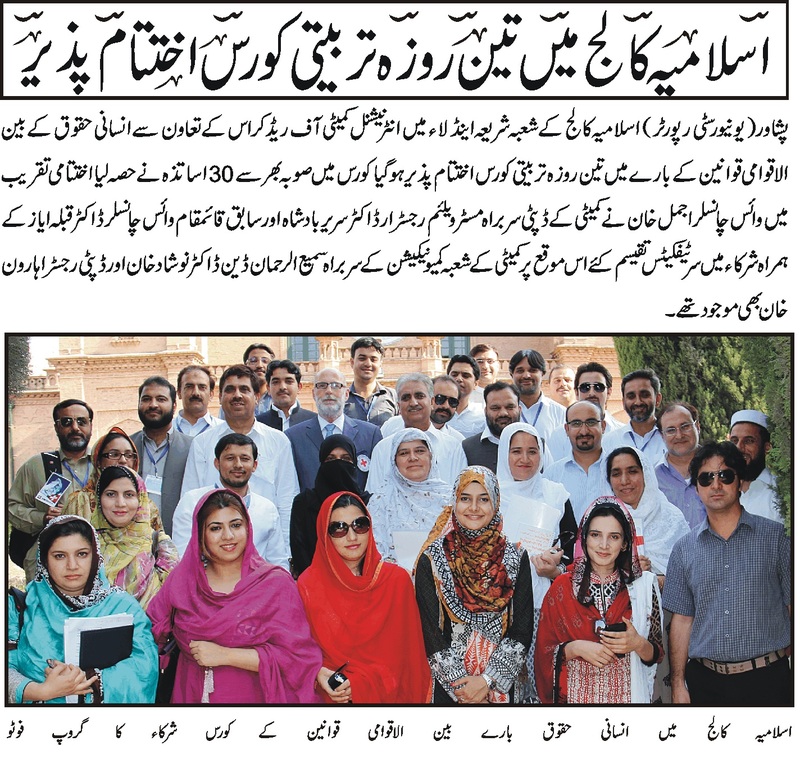 06-06-2016 Daily Aaj Establishment of Advance Research Lab in Islamia College Peshawar. 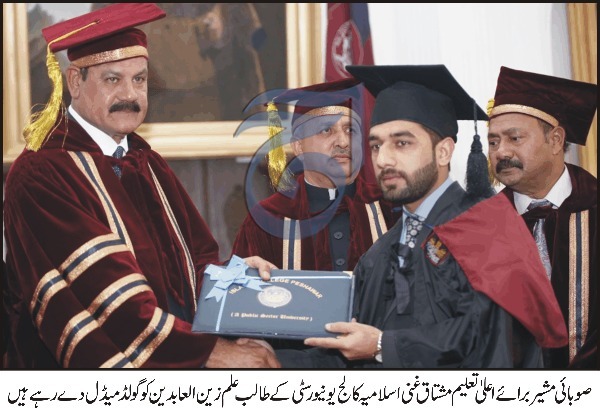 01-06-2016 Daily Aaj PhD Scholar Wesal Muhammad completed his Phd in Botany from Islamia College Peshawar. 25-05-2016 Daily Aaj Department of Statistics organized workshop on impotence of Research. 24-05-2016 Daily Aaj Department of Statistics organized workshop on impotence of Research. 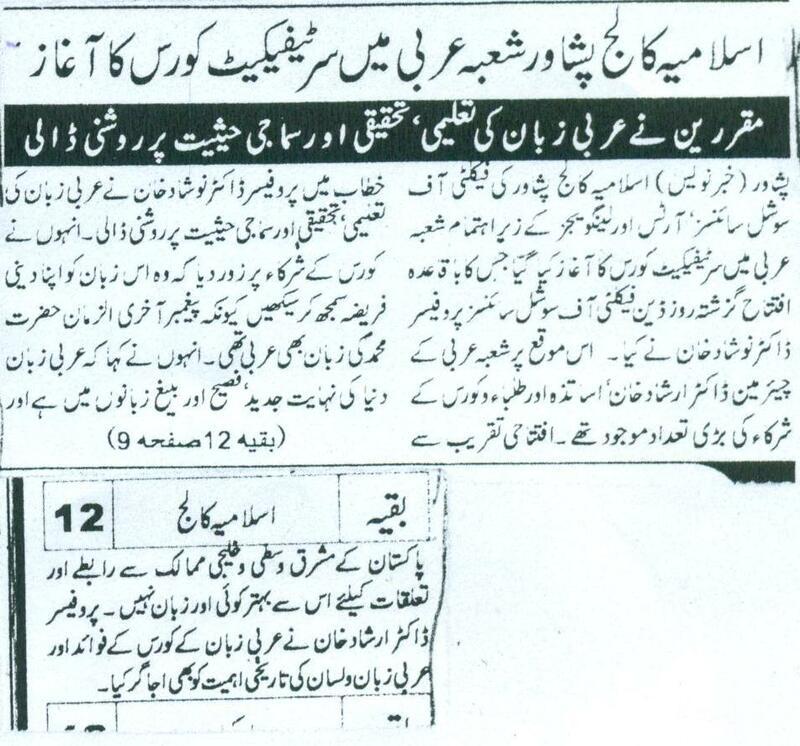 13-05-2016 Daily Mashriq Pre-Qualification of consultants for the project construction of Multi Storey commercial Plaza at Khyber Bazar , Peshawar and Charsadda Bazar on the property of Islamia College, Peshawar. 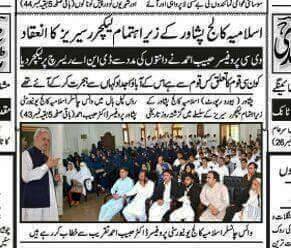 06-05-2016 Daily Express Seminar on CPEC in islamia College Peshawar. 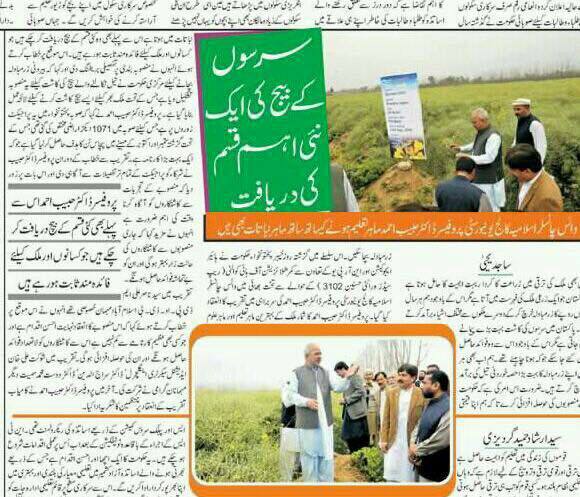 01-05-2016 Jhang Sunday Magazine. 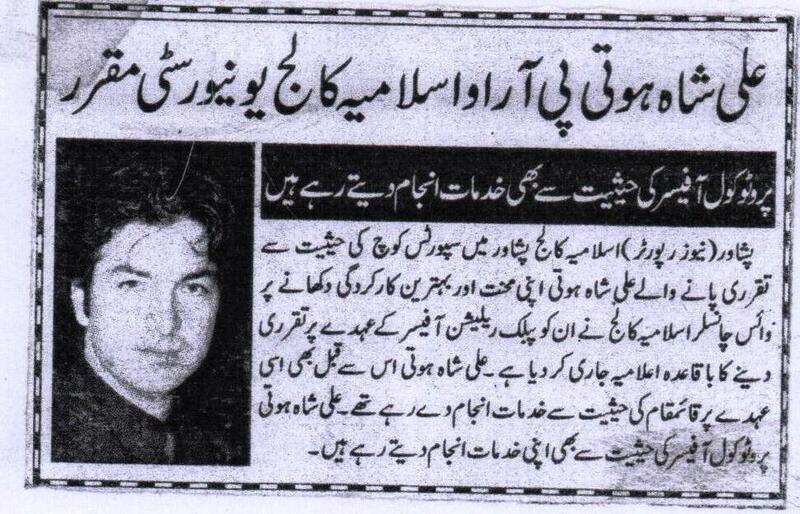 Feature article regarding Islamia Collegiate School , Peshawar. 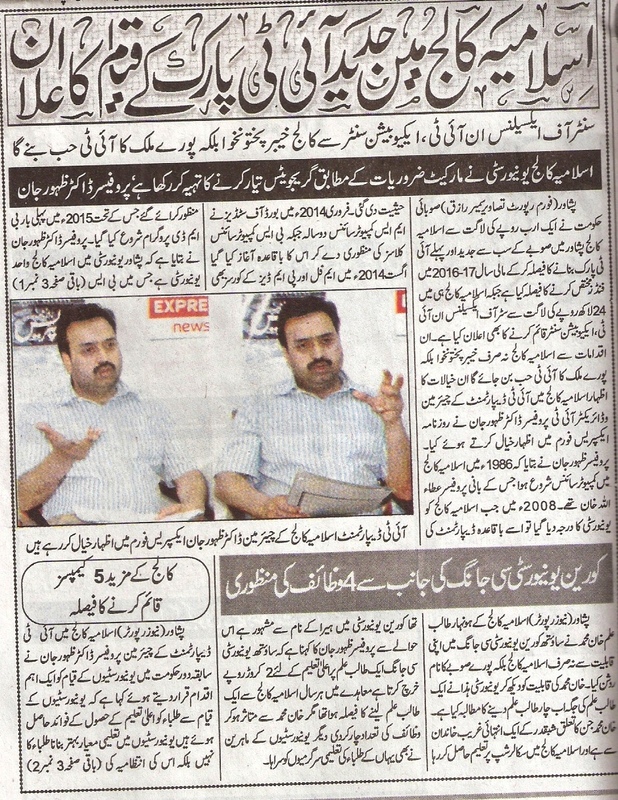 26-04-2016 Daily Express Dr. Zahoor Jan HOD department of Computer Science interview with the Express Daily Paper. 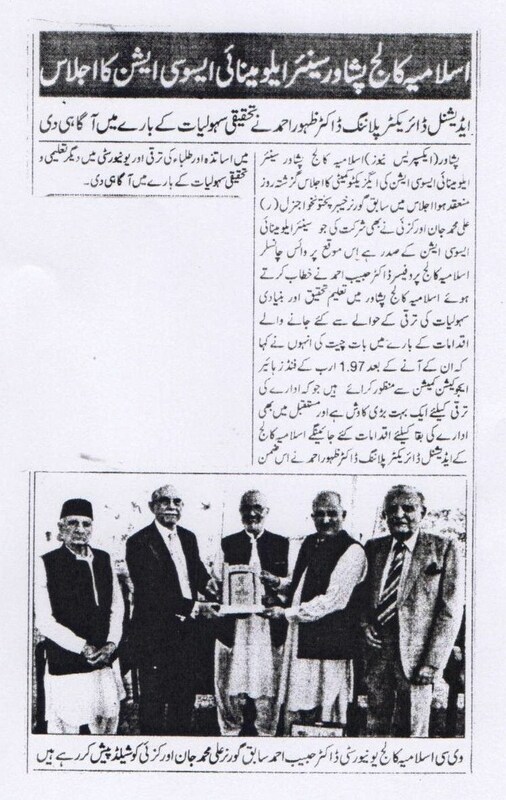 12-04-2016 Daily Aaj Vice Chancellor Mr. Ajmal Khan present Souvenir to Ex-VC Prof. Dr Muhammad Jahanzeb Khan. 12-04-2016 Daily Aaj Video Conference Hall established in Islamia College for Girls. 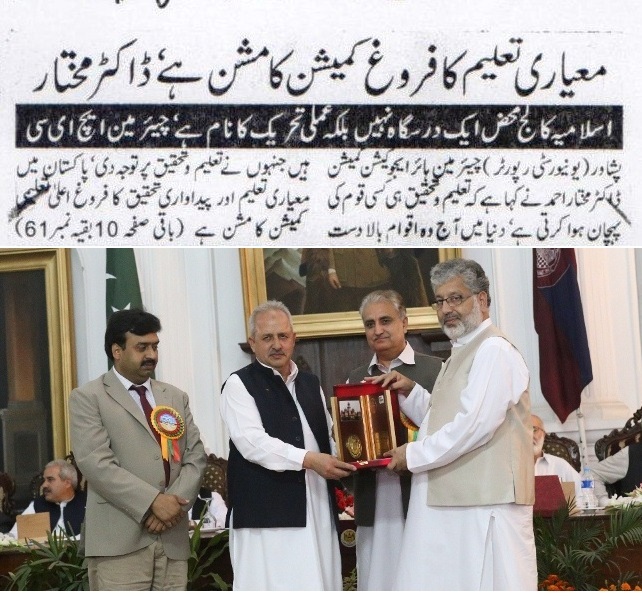 12-04-2016 Daily Aaj A function in the recognition of retired employee of Islamia College Peshawar. 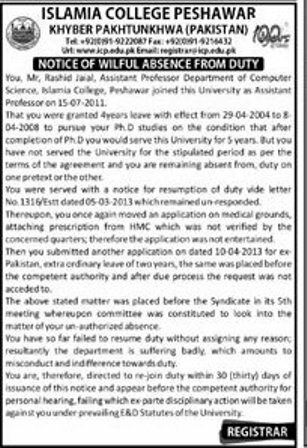 01-04-2016 Daily Aaj Mr. Fazal Wahid Lecturer Economics completed his PhD from University of Peshawar. 30-03-2016 Ausaf Sunday Magazine. 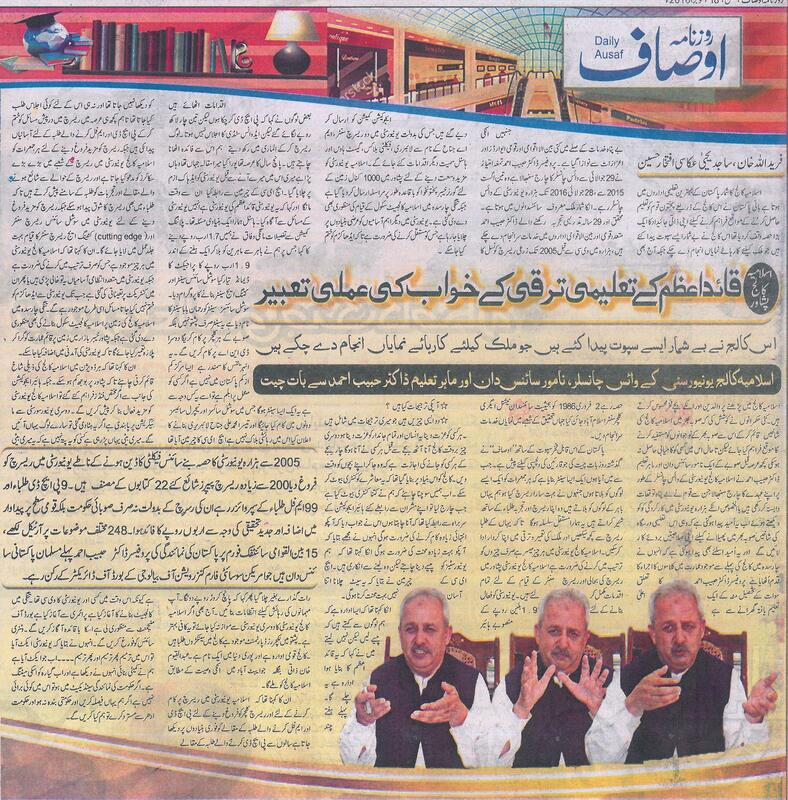 Interview of Vice Chancellor Mr. Ajmal Khan with the Ausaf Sunday Magazine. 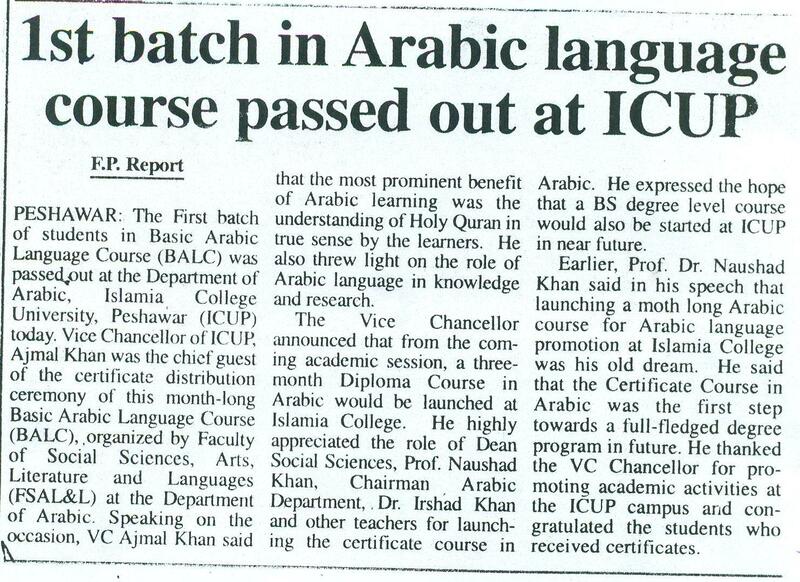 14-03-2016 Daily Aaj Two Scholar of Department of English ICP completed their MPhil Degree. 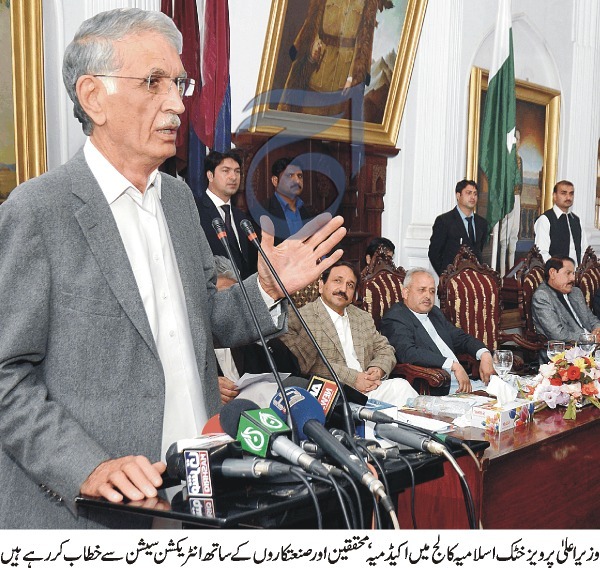 14-03-2016 Daily Aaj Islamia College employee did not received bonus salary announced by Chief Minister KPK. 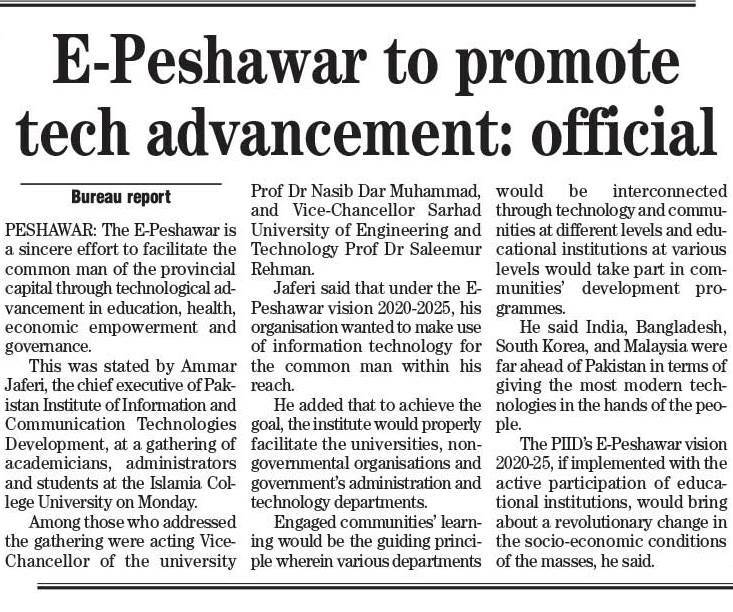 14-03-2016 Daily Aaj CM backs proposal for setting up research center at Islamia College Peshawar. 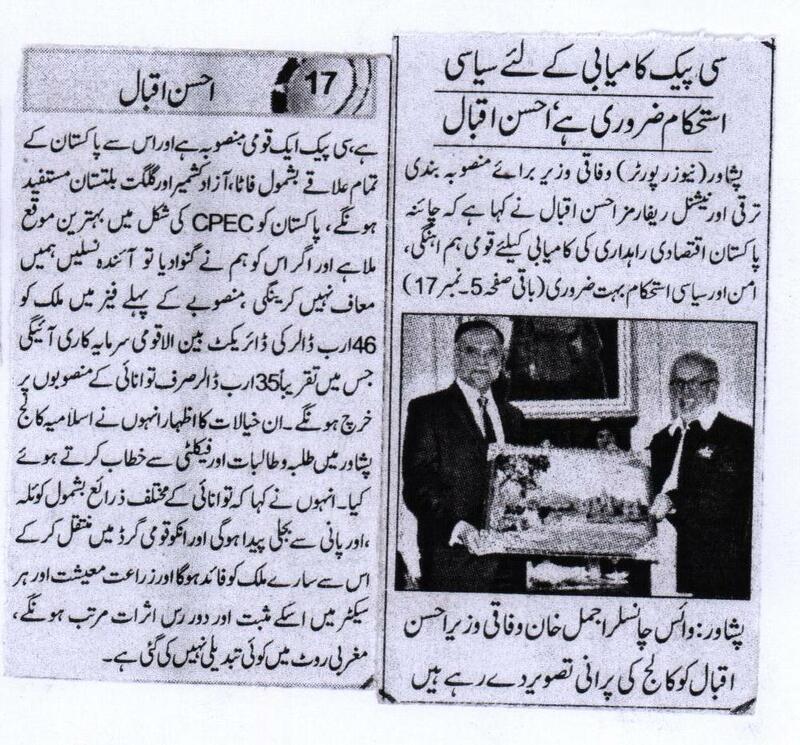 04-03-2016 Daily Mashriq One Day Seminar on CPEC organized by Department of Pakistan Studies Islamia College, Peshawar. 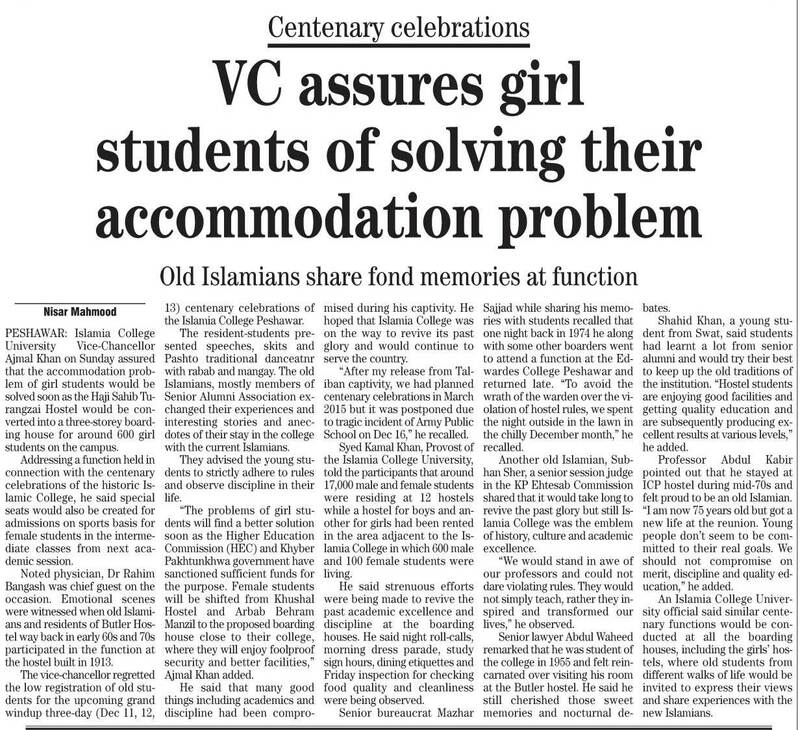 27-02-2016 Daily Aeen Feature article regarding Centenary Celebration of Islamia College, Peshawar. 25-02-2016 Daily Aaj Prof. Dr. Shad Ali Khan appointed as Dean , Faculty of Life & Chemical Sciences. 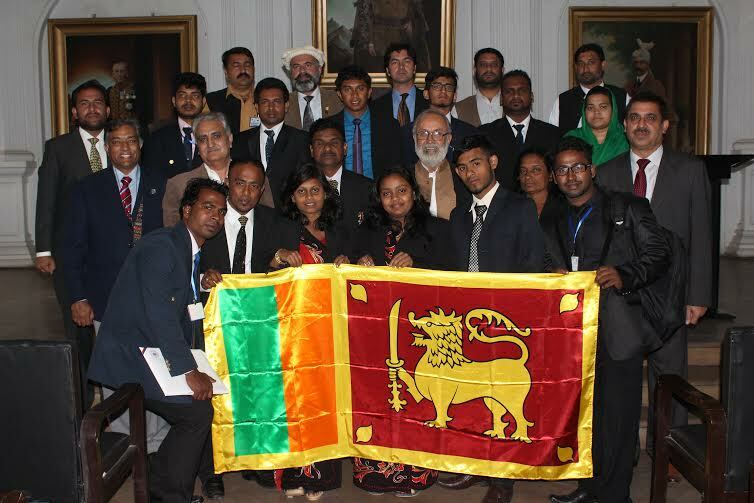 24-02-2016 Daily Aaj Private admission open in BA and MA for the Session 2016. 23-02-2016 Daily Aaj Mr. Noor Ul Amin Lectrure Pakistan Studies completed his PhD from Area Study Center University of Peshawar. 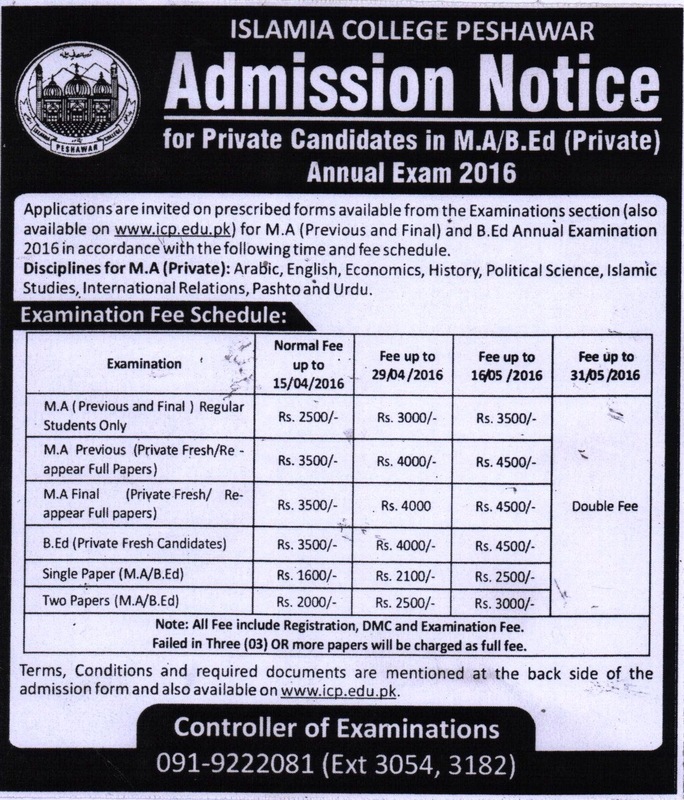 22-01-2016 Daily Mashriq Admission Notice for private candidate in M.A/B.Ed Annual Exam 2016. 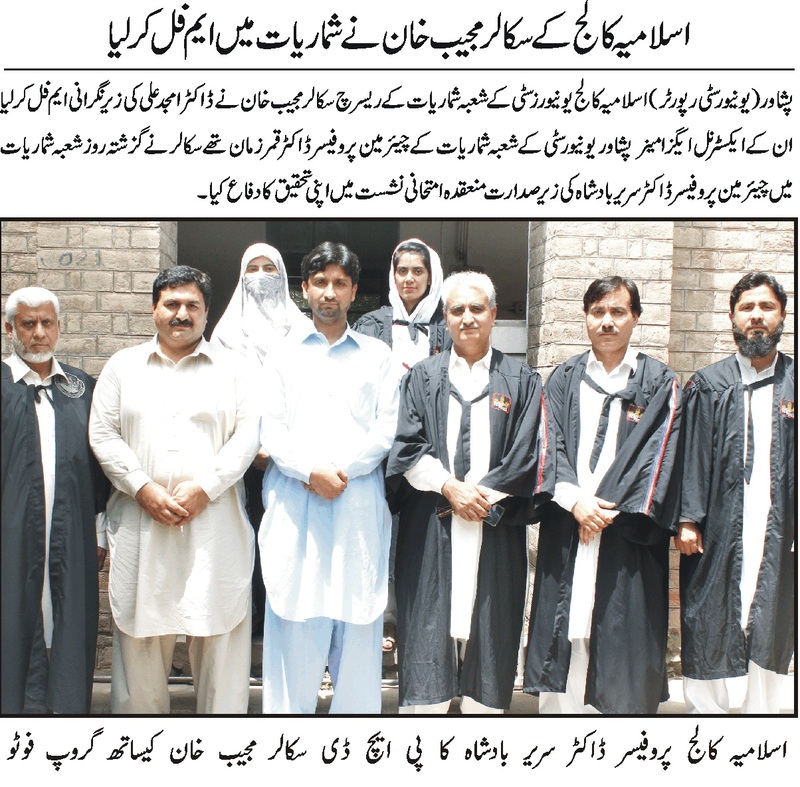 18-02-2016 Daily Mashriq Group photo of new Proctorial Board with Vice Chancellor Mr. Ajmal Khan. 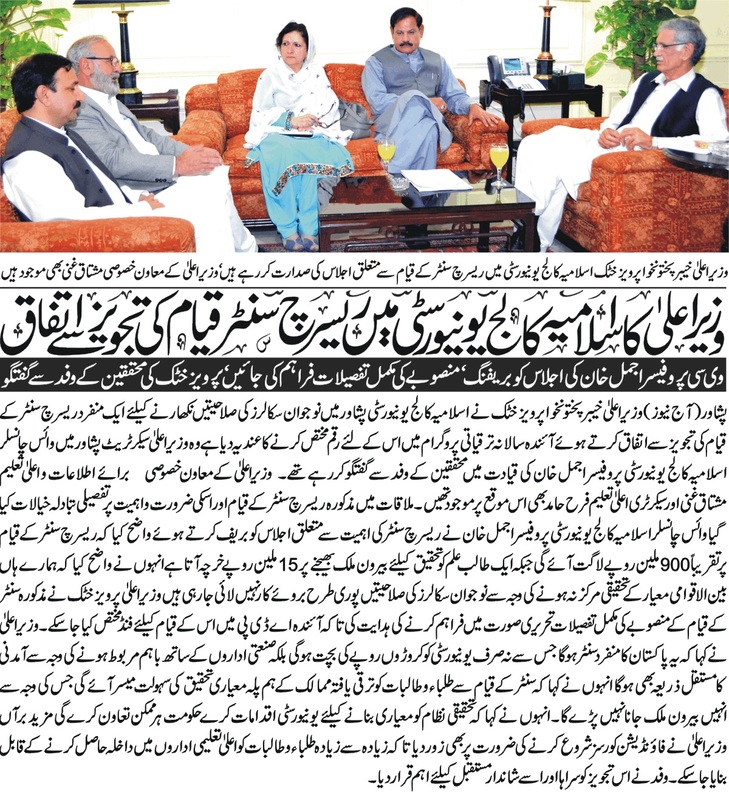 15-02-2016 Daily Aaj Education in KP passing through critical stage. 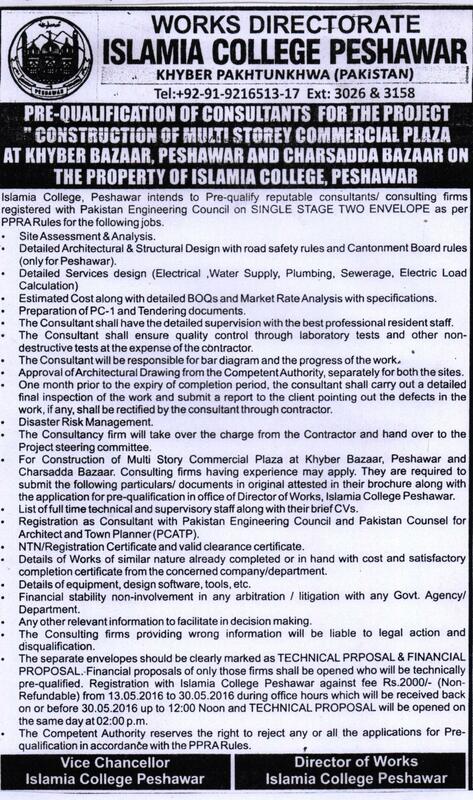 10-02-2016 Daily Aaj Islamia College, Peshawar is progressing toward success. 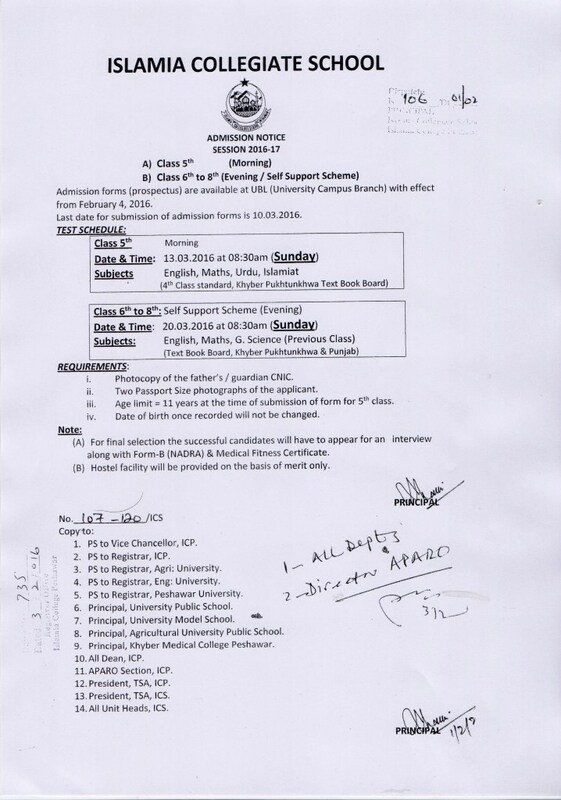 03-02-2016 Daily Aaj Islamia Collegiate School admission notice for Session 2016-17. 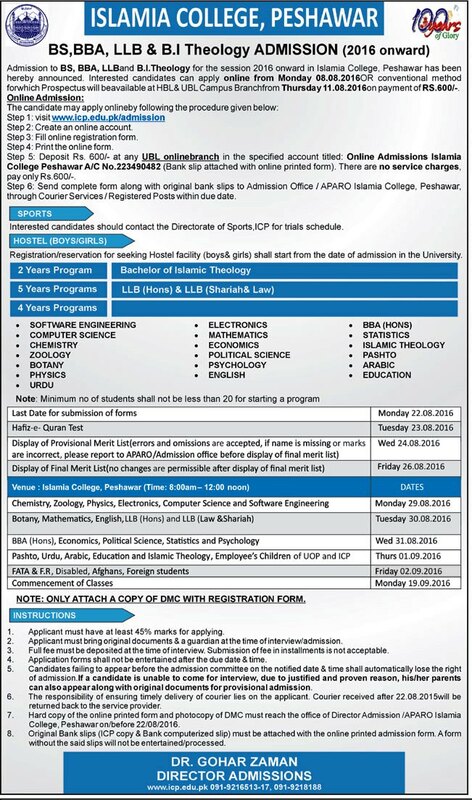 28-01-2016 Daily Aaj MPhil / PhD admission open in Botany and Chemistry. 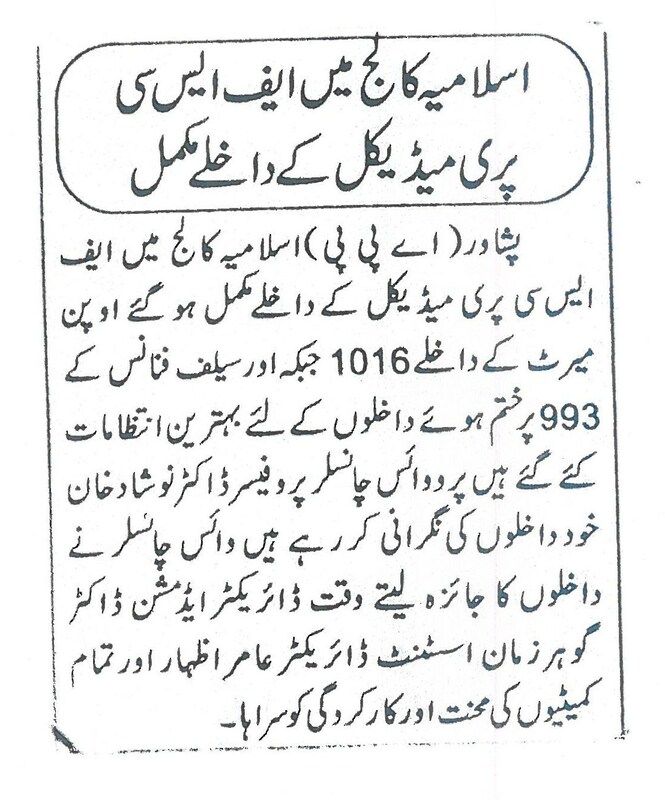 18-01-2016 Daily Aaj Centenary Celebration of Islamia College Peshawar. 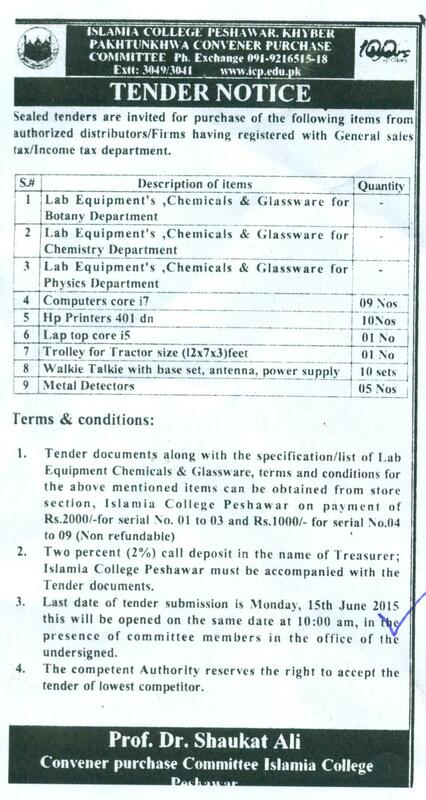 16-01-2016 Daily Aaj Tender Notice for Chemicals by Department of Chemistry. 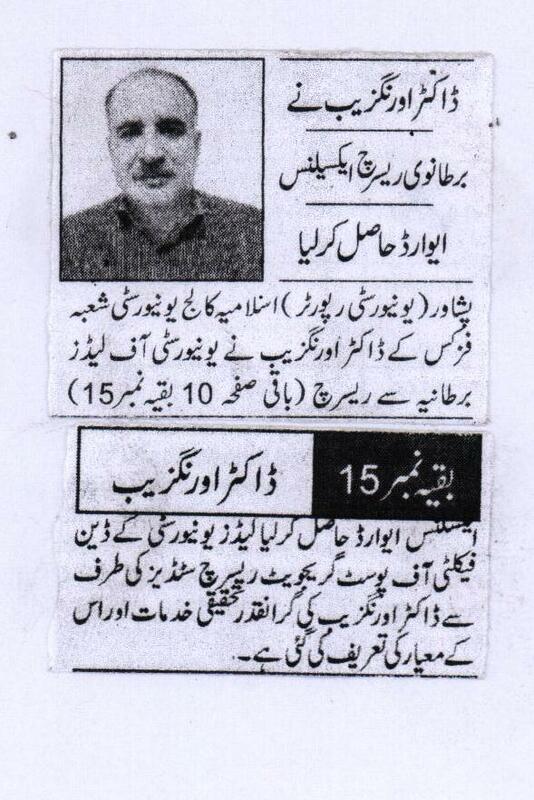 14-01-2016 Daily Aaj Government constituted independent search committee for Vice Chancellor appointment. 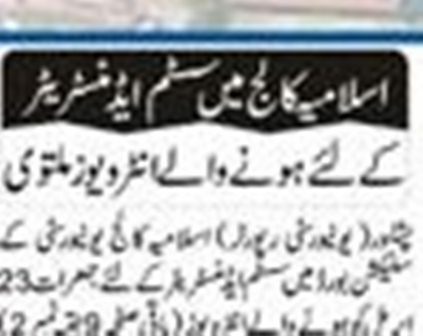 12-01-2016 Daily Mashriq Election of Teaching Staff Association Islamia College, Peshawar. 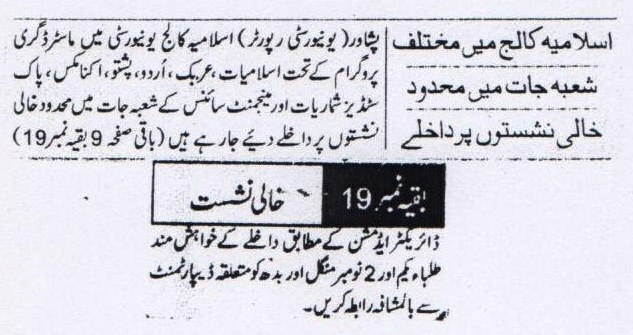 12-01-2016 Daily Aaj Election of Class –III Employee Association Islamia College, Peshawar. 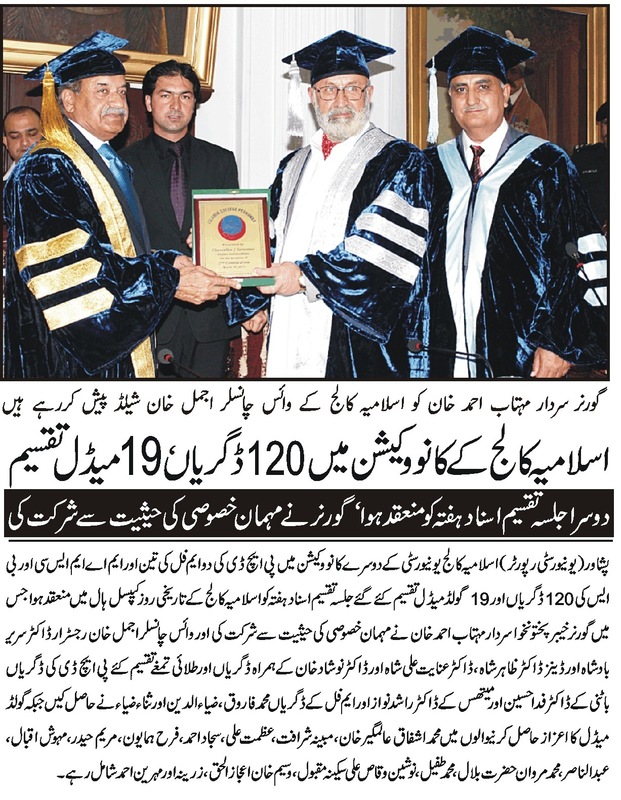 11-01-2016 Daily Aaj Report on centenary celebration of Islamia College, Peshawar. 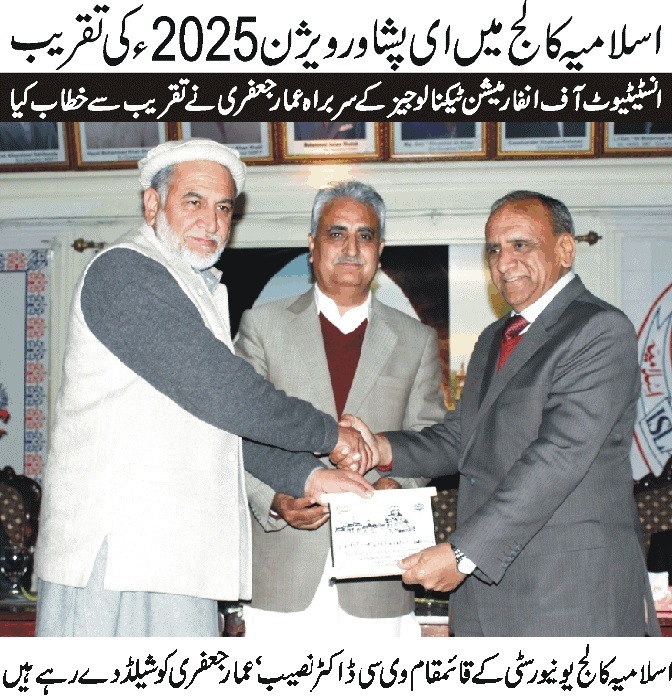 07-01-2016 Daily Aaj Election of Academic Manger Association of Islamia College, Peshawar. 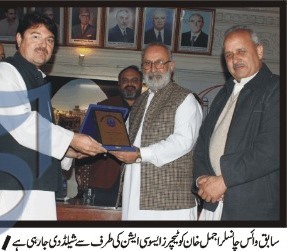 13-12-2012 Daily Aaj Shield present to important dignities at Islamia college, Peshwar Centenary Celebration. 12-12-2012 Daily Aaj Prime Minister Muhammad Nawaz Sharif Addressing at Centenary Celebration of Islamia College Peshawar. 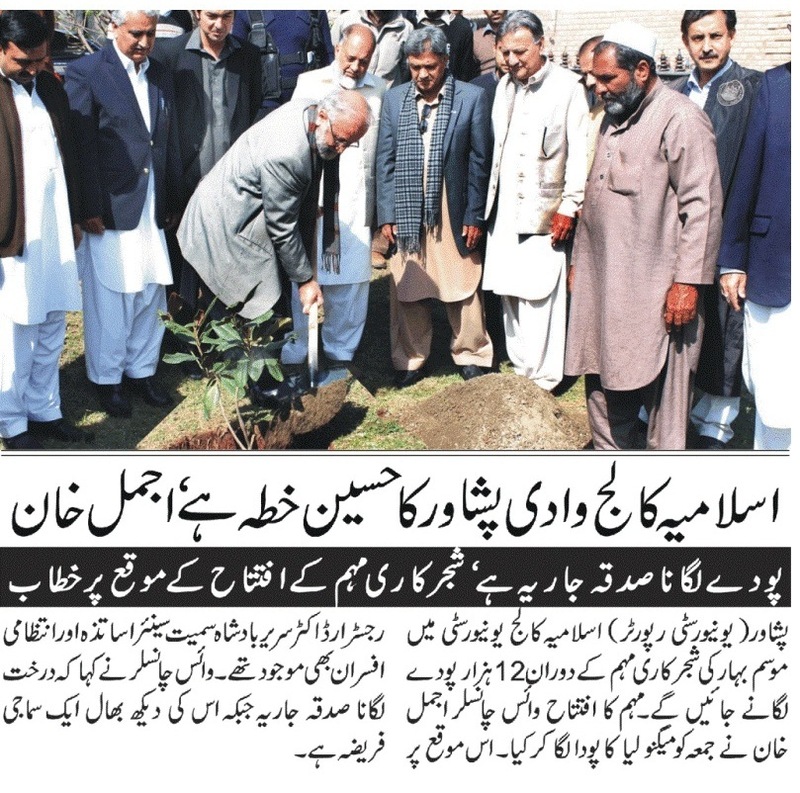 09-12-2015 Daily Aaj Centenary Celebration of Islamia College, Peshawar and Islamia Collegiate School. 07-12-2015 The News Vice Chancellor assure girls student to solve their accommodation problem. 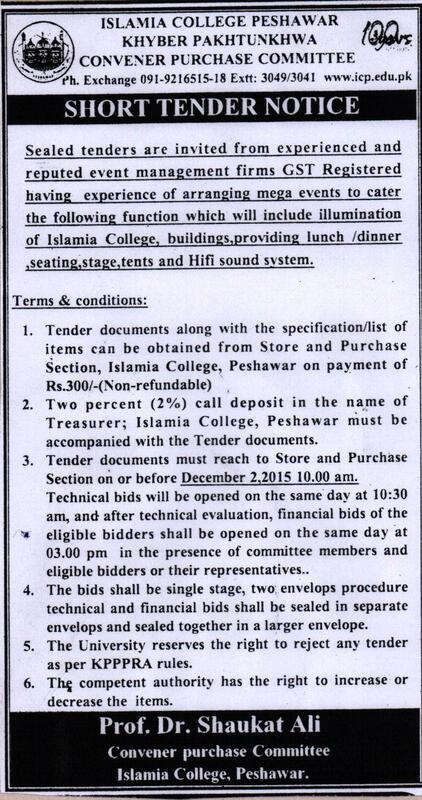 06-12-2015 Daily Aaj Advertisement of Centenary Celebration of Islamia College, Peshawar. 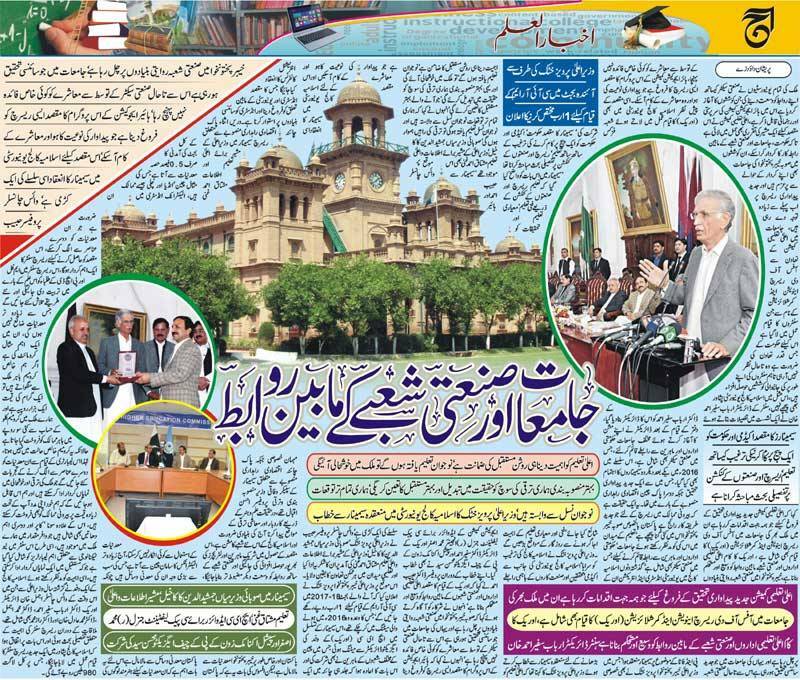 05-12-2015 Daily Aaj Advertisement of Centenary Celebration of Islamia College, Peshawar. 02-12-2015 Daily Aaj Third Convocation full dress rehearsal will be held on 9 December 2015. 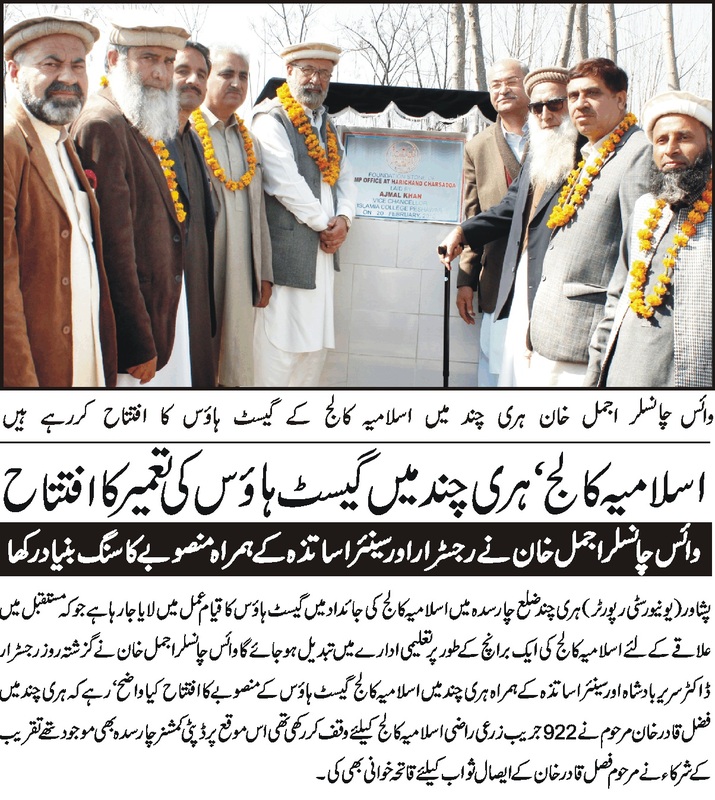 02-12-2015 Daily Aaj Centenary Celebration Functions in different Hostels of Islamia College, Peshawar. 02-12-2015 Daily Aaj NTS test for the appointment of various positions. 01-12-2015 Daily Aaj Centenary Celebration function in Orintal Hostel. 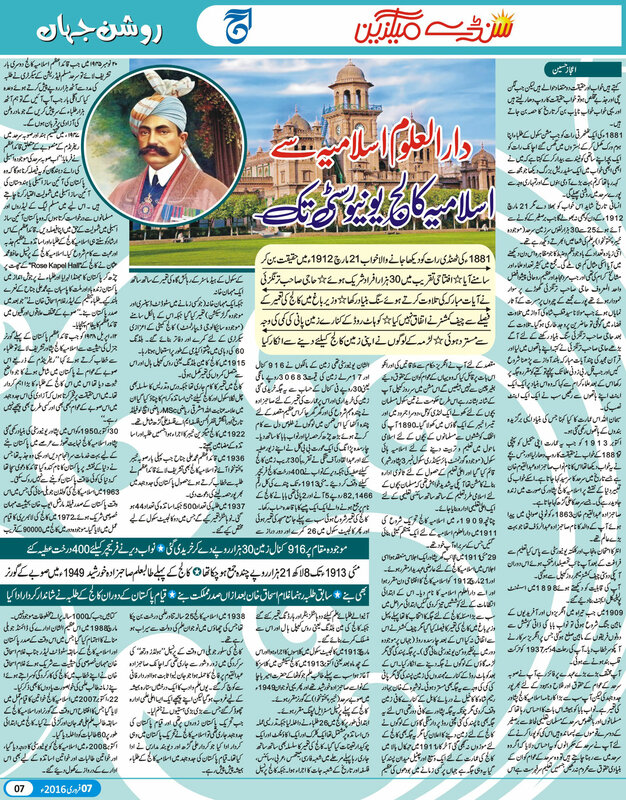 30-11-2015 Daily Aaj News regarding Centenary Celebration of Islamia College, Peshawar. 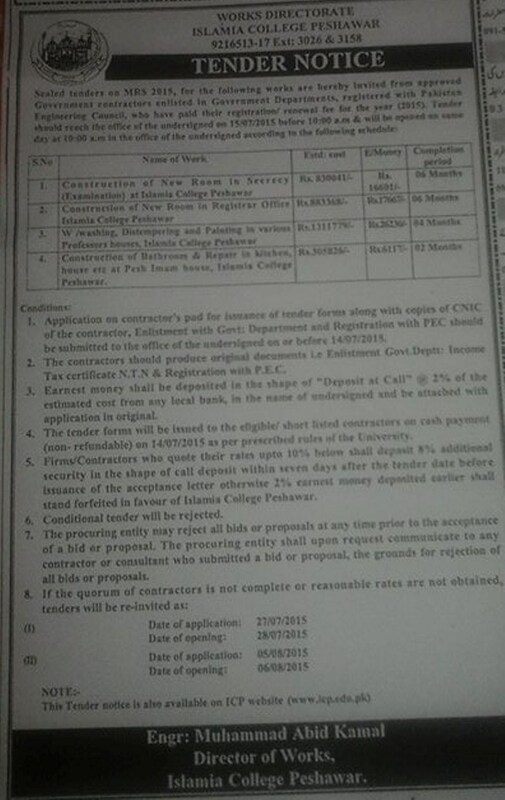 27-11-2015 Daily Aaj Short tender notice by Central Purchase Committee. 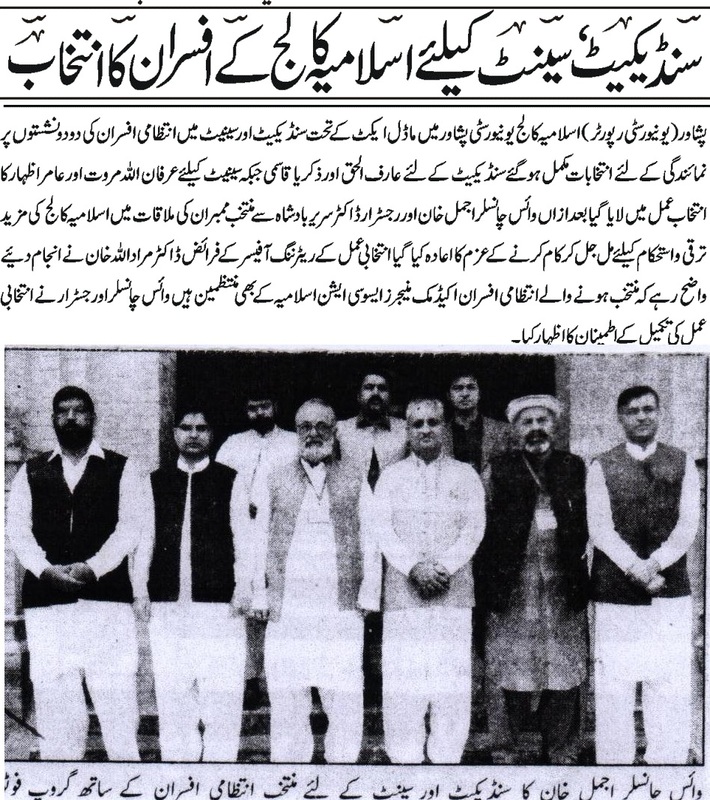 24-11-2015 Daily Aaj Srilinkan delegation visit Islamia College, Peshawar. 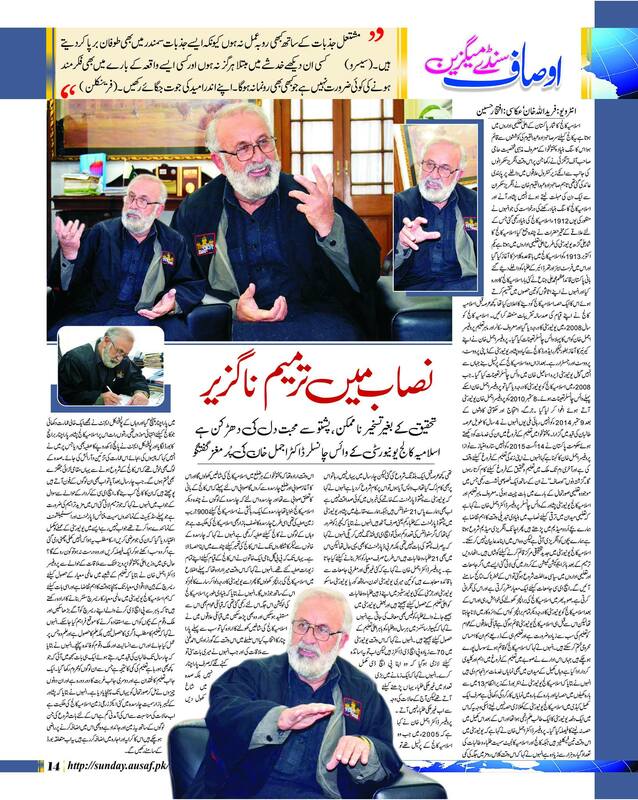 23-11-2015 Daily Aaj Eng. 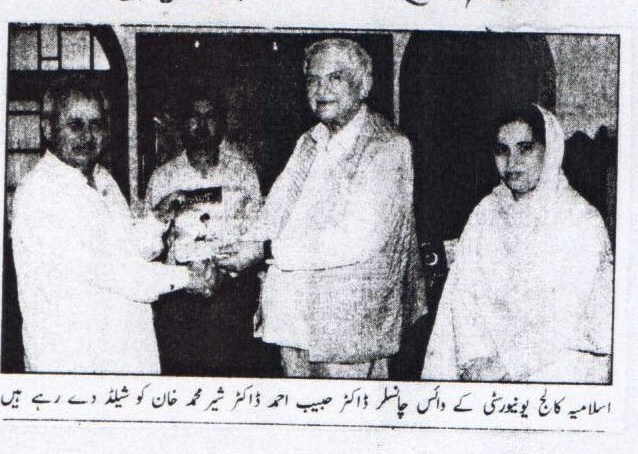 Aurang Zeb Khalil present donation cheque to Vice Chancellor Ajmal Kha for Centenary Celebrations . 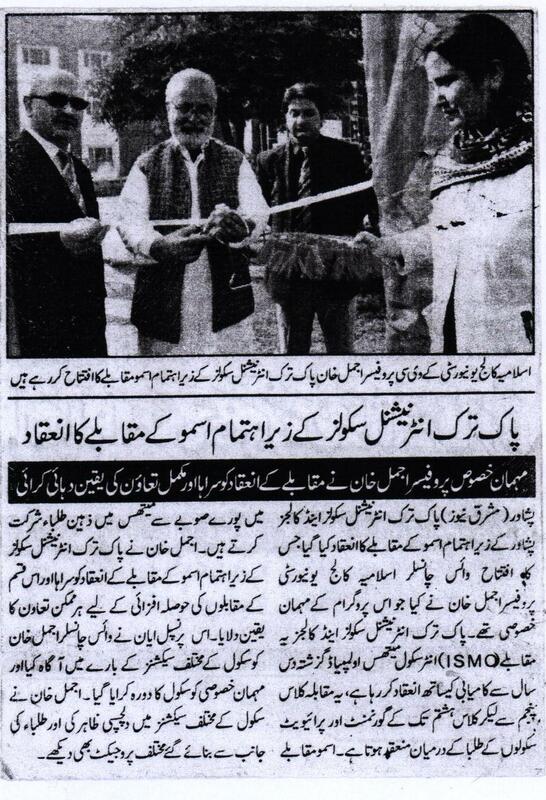 23-11-2015 Daily Mashriq Opening Ceremony by Vice Chancellor Ajmal Khan of Asmo competition in Pak-Turk international Schools. 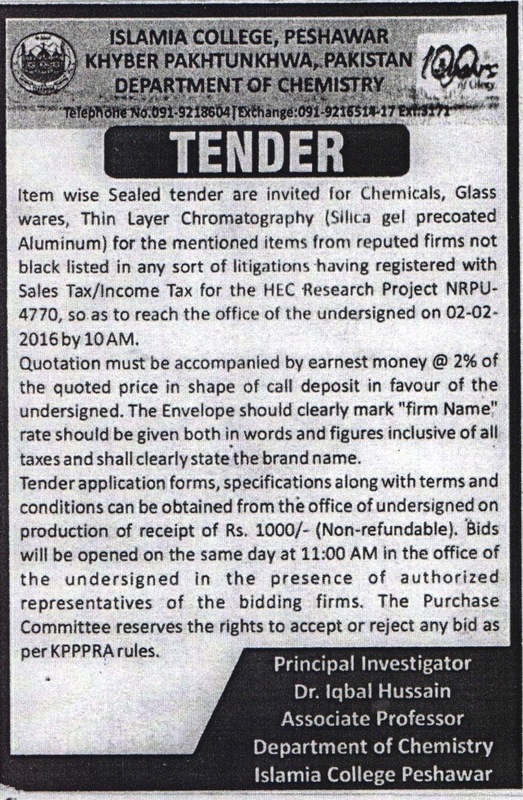 21-11-2015 Daily Aaj Tender notice for various items. 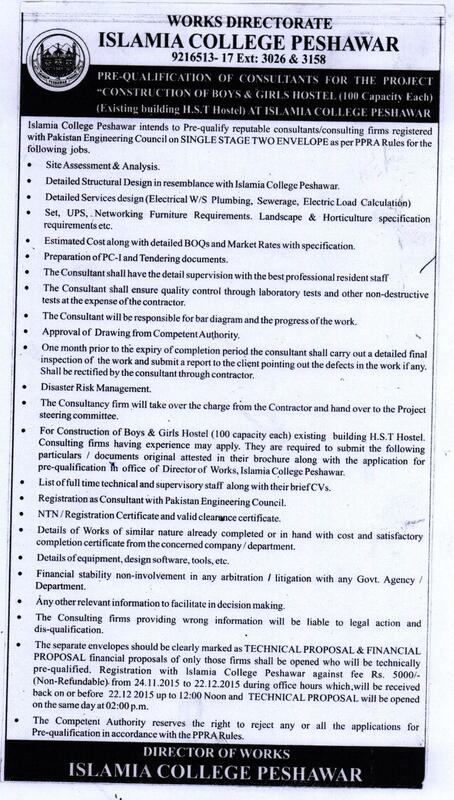 20-11-2015 Daily Aaj Pre-Qualification of consultant for the project construction of Boys and Girls Hostel. 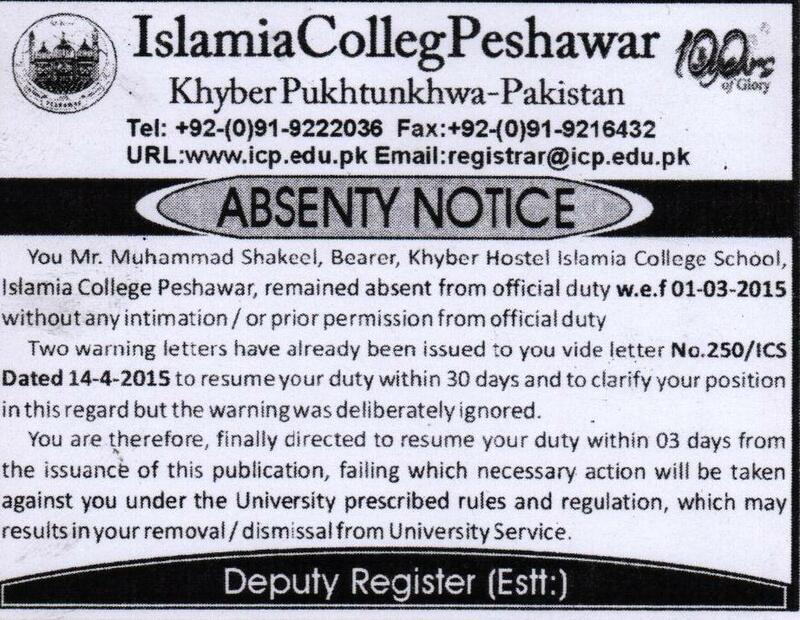 18-11-2015 Daily Aaj V.I.P across the country are expected to participate in centenary celebration of Islamia College, Peshawar. 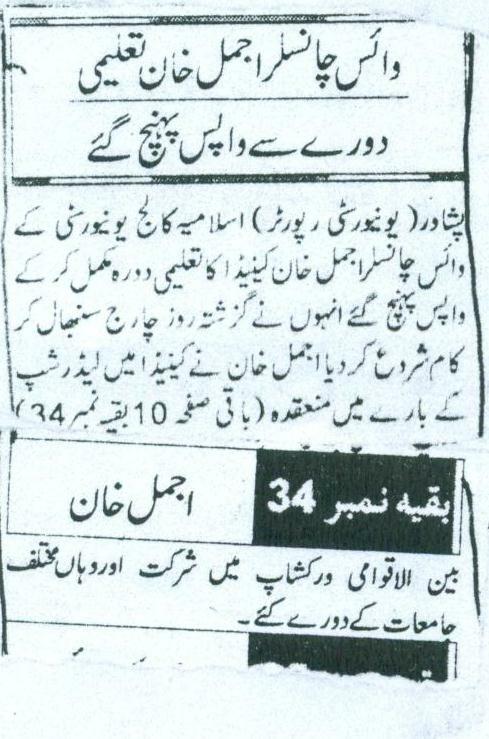 16-11-2015 Daily Aaj Noman khan get first position in Urdu Department Islamia College, Peshawar. 14-11-2015 Daily Aaj M.A annual examination 2015 result announced. 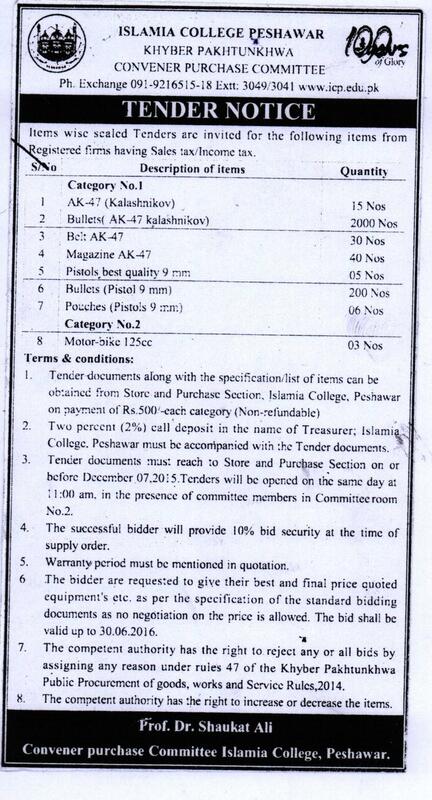 13-11-2015 Daily Aaj Items wise sealed tenders are invited for various items. 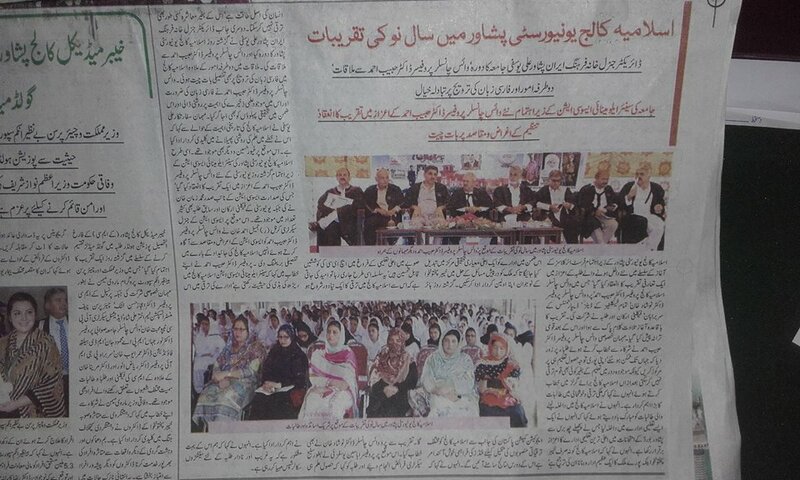 12-11-2015 Daily Aaj Seminar on Iqbal Day. 09-11-2015 Dawn Car Show organized at Islamia College, Peshawar. 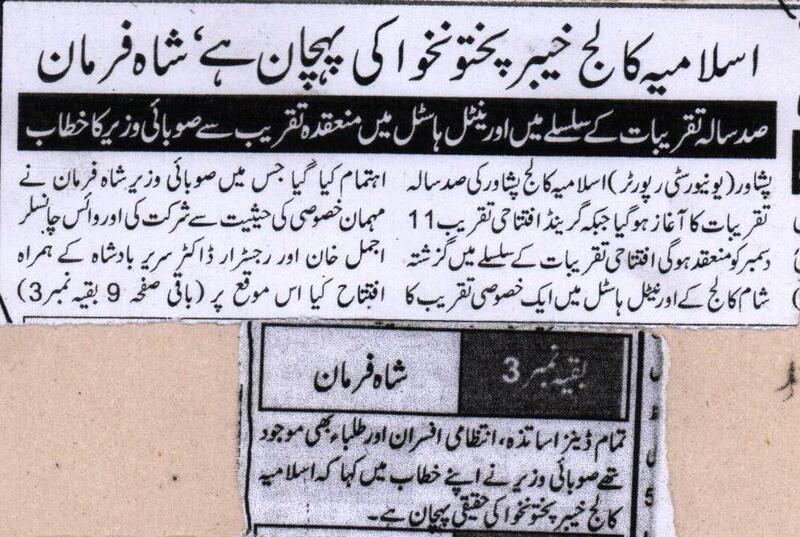 09-11-2015 Daily Mashriq Car Show organized at Islamia College, Peshawar. 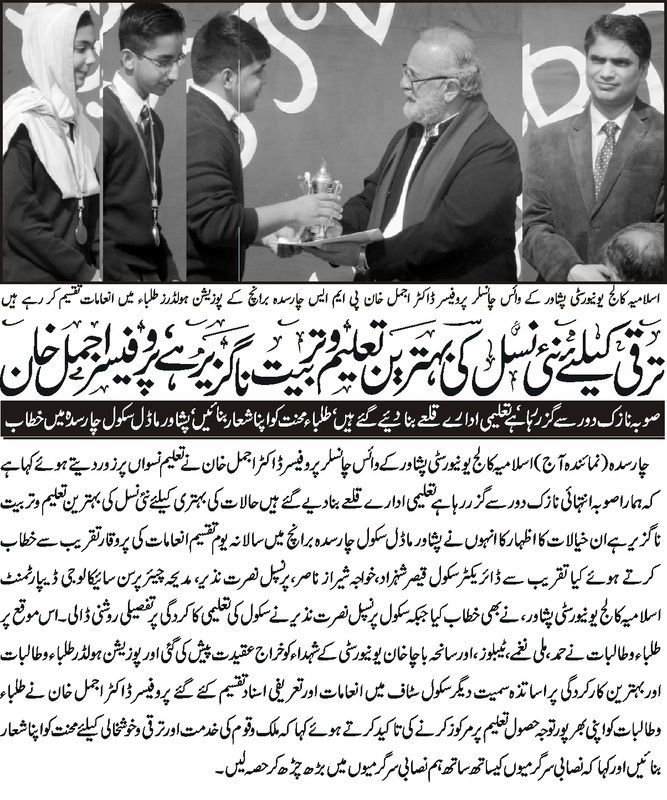 07-11-2015 Daily Mashriq Islamia College, Peshawar announced awards for the fresh talented graduates. 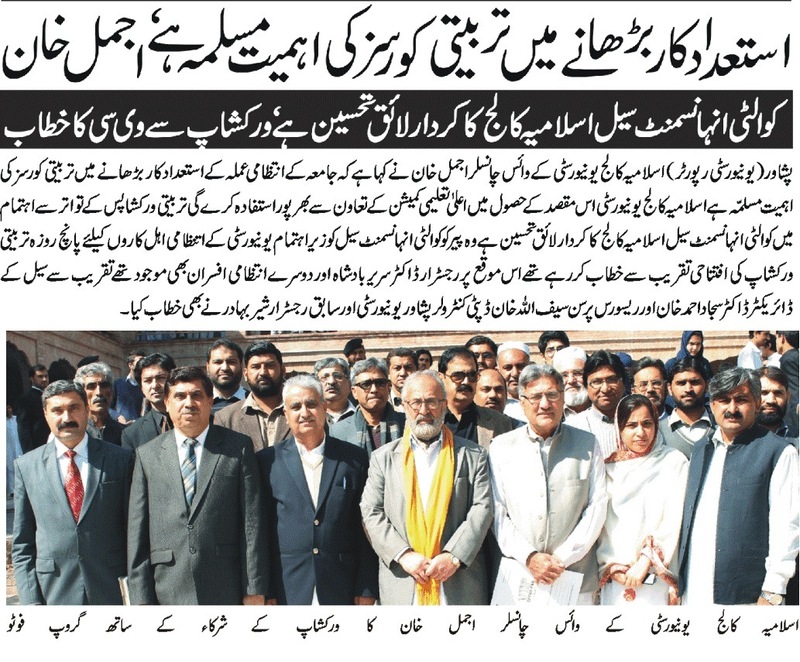 04-11-2015 Daily Aaj Group photo of Vice Chancellor Mr. Ajmal Khan with the elected members of Senate and Syndicate. 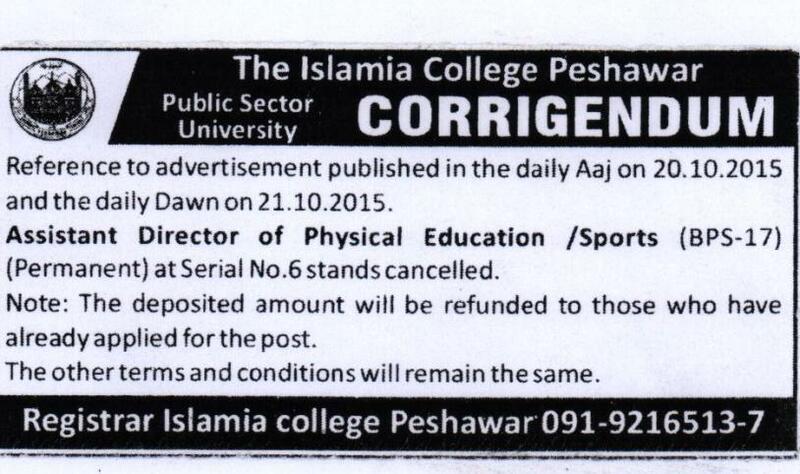 20-10-2015 Daily Aaj Corrigendum regarding advertisement on 20-10-2015. 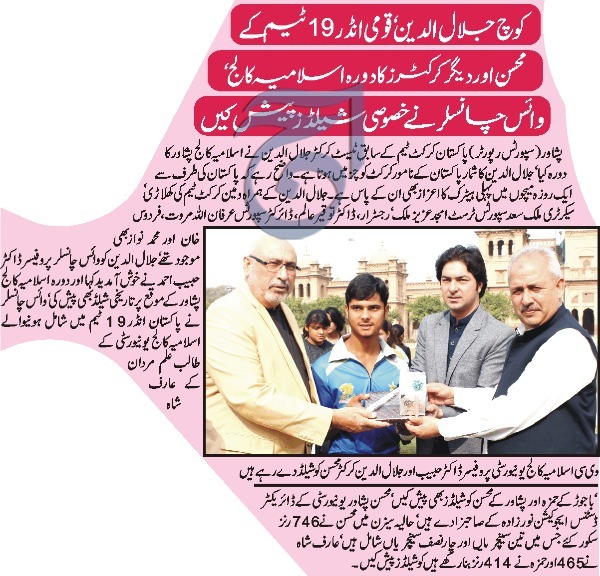 22-10-2015 Daily Aaj Qirat competition in Islamia College, Peshawar. 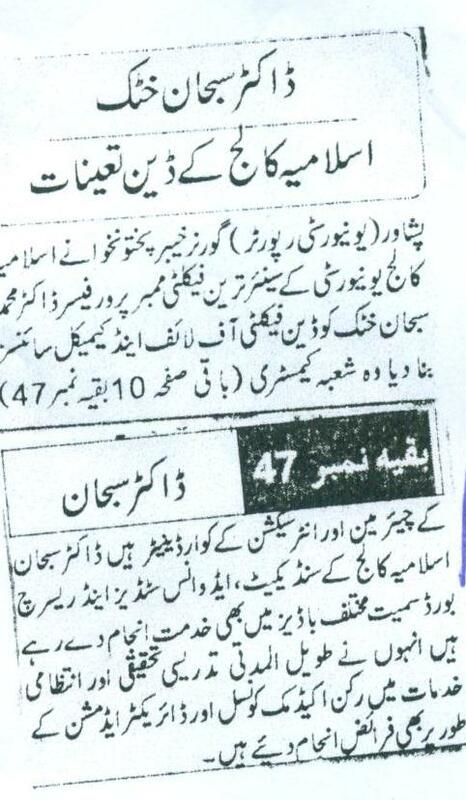 12-10-2015 Daily Aeen Election of Senior alumni in Isalmai College, Peshawar. 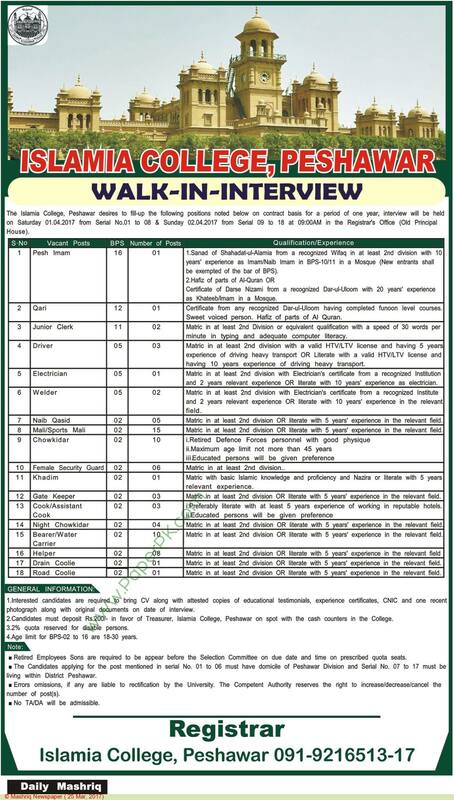 05-10-2015 Daily Aaj Walk in Interview for visiting teachers. 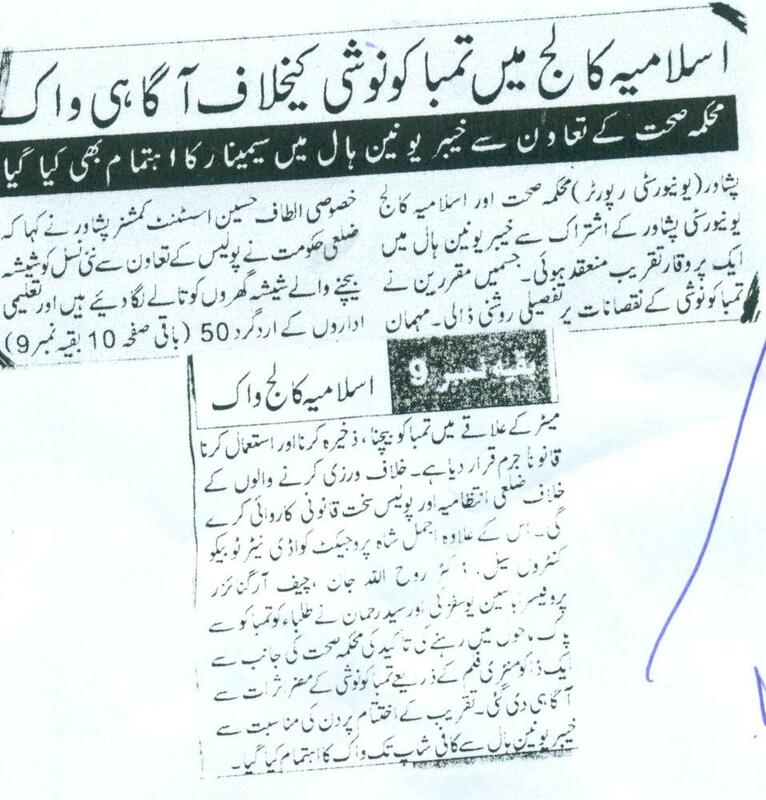 01-10-2015 Daily Mashriq Preparation with full swim has started for Centenary Celebration in Islamia College, Peshawar. 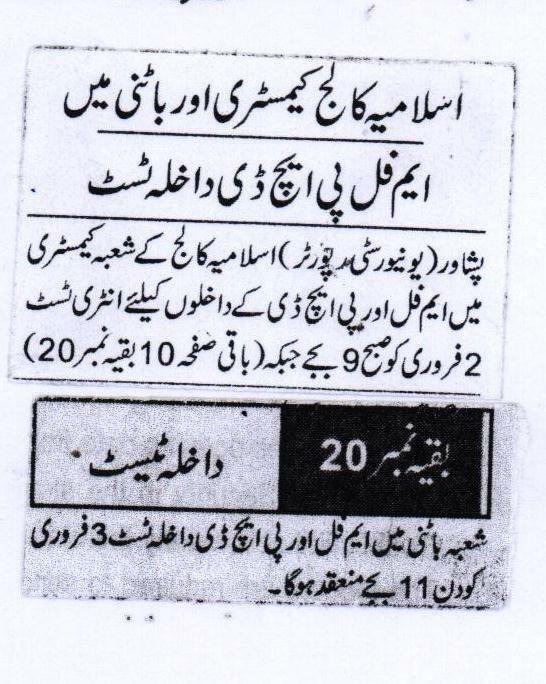 30-09-2015 Daily Aaj 3rd Convocation of Islamia College, Peshawar for the regular graduates of session 2014 is scheduled on November 08, 2015. 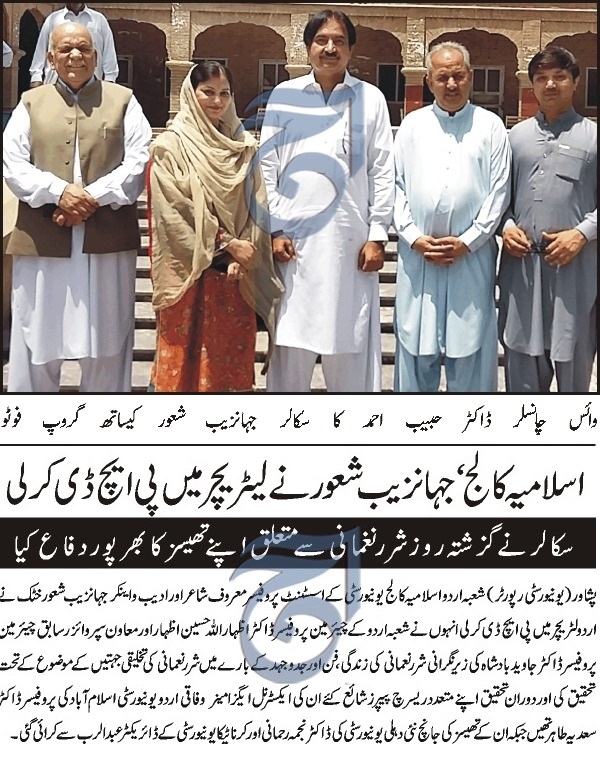 23-09-2015 Daily Aaj MPA Aaysha Gulalai visited Islamia College, Peshawar. 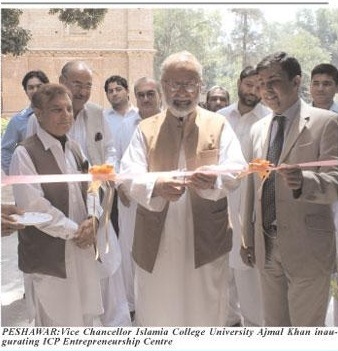 23-09-2015 Daily Aaj Islamia College, Peshawar is progressing despite of problems (VC Ajmal Khan). 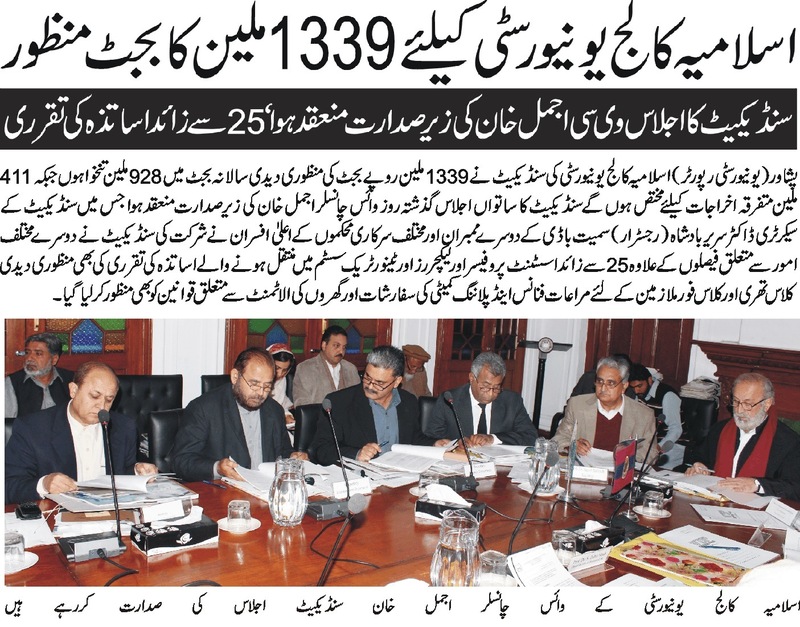 19-09-2015 Daily Aaj Third Convocation of Islamia College, Peshawar will be held in November, 2015. 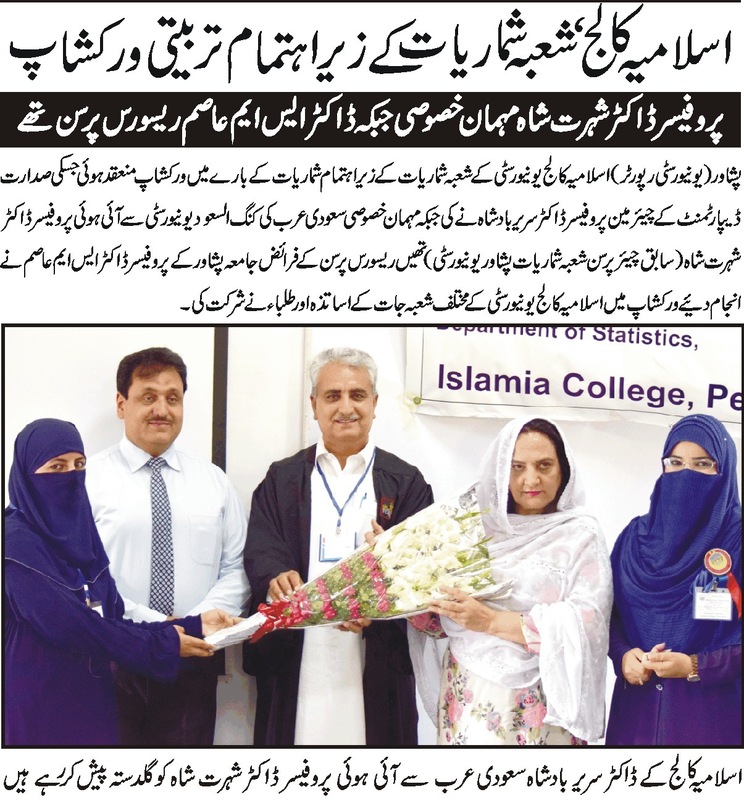 13-09-2015 Daily Aaj Prof. Dr. Inayat Ali shah Dean, Faculty of Physical and Numerical Sciences elected as Syndicate member. 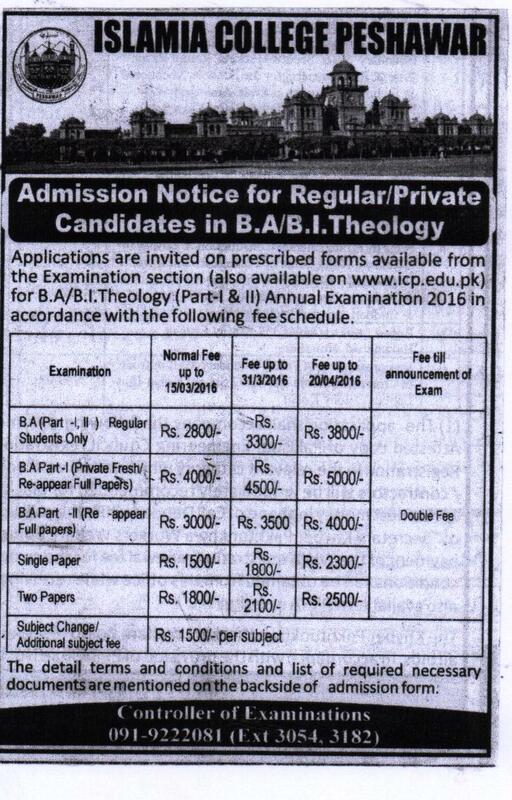 12-09-2015 Daily Aaj ETEA Test date and location is changed. 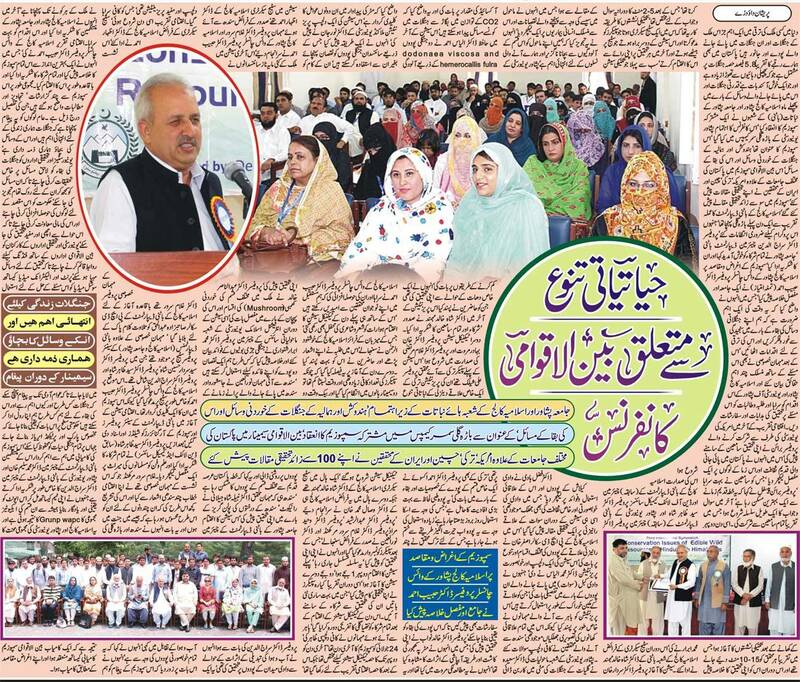 09-09-2015 Daily Aaj International Day of Physiotherapy Conference was held in Islamia College, Peshawar. 08-09-2015 Daily Aaj Photograph with Registrar, Head of Department and Dr. Muhammad Sajjad before departure to Korea. 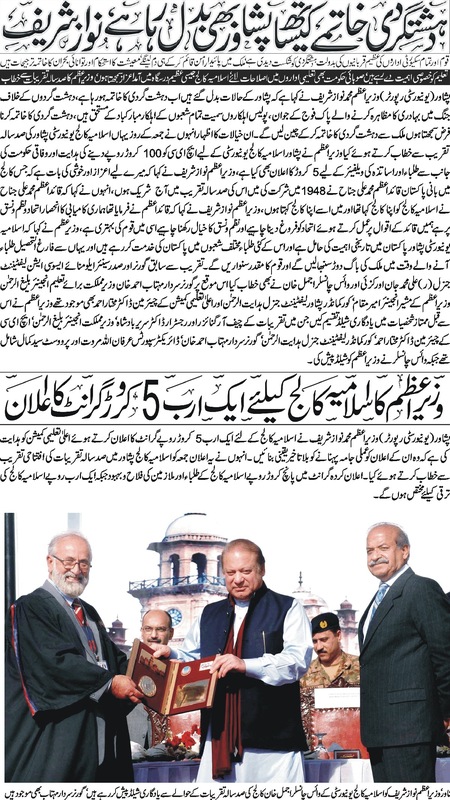 07-09-2015 Daily Aaj 6 September. 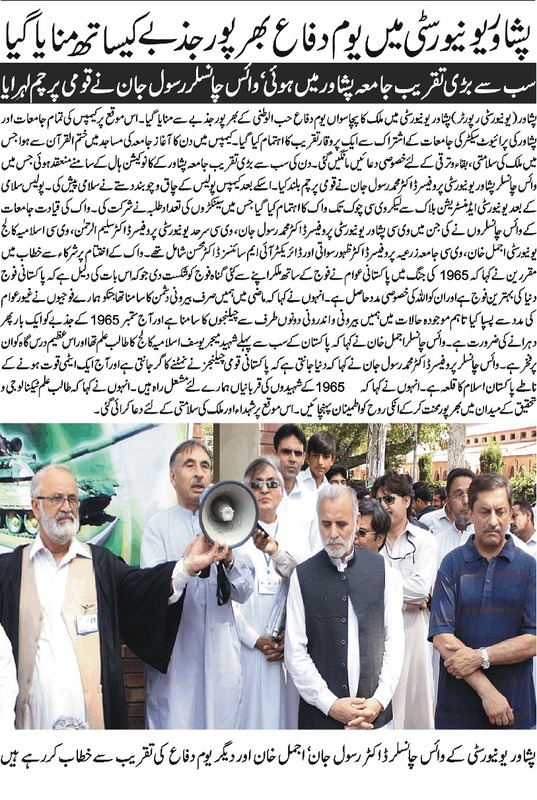 2015 Defense Day celebrated by Government and Private Universities in university of Peshawar. 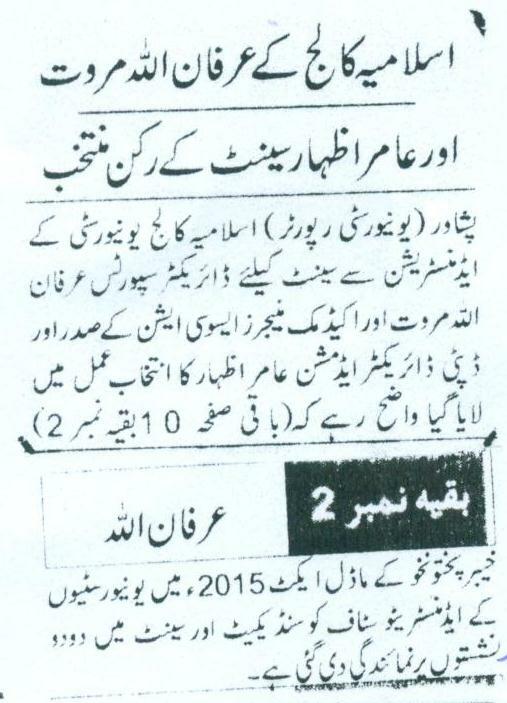 03-09-2015 Daily Aaj MS / MPhil admission open for the Session 2015. 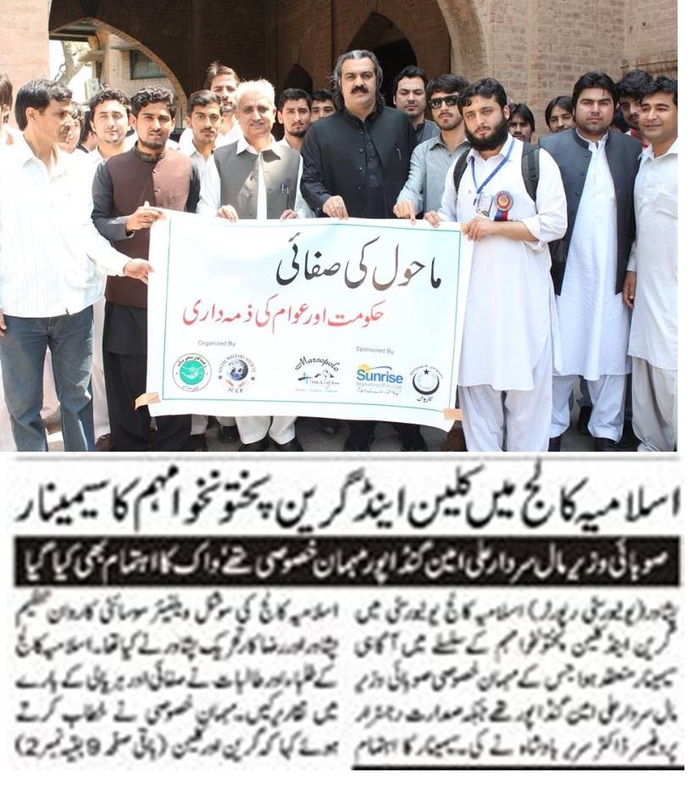 30-08-2015 Daily Aaj Mr. Ajmal Khan, Vice Chancellor, Islamia College, Peshawar appeal for the financial assistants for poor students. 27-08-2015 Daily Aaj Orientation class for first year students on September 1, 2015. 27-08-2015 Daily Aaj Viva Voce Exam of M.A will be conducting on August 29, 2015. 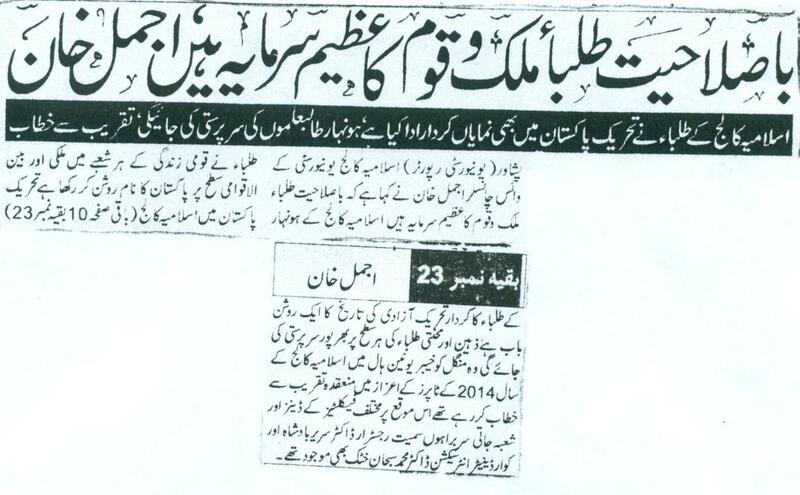 16-08-2015 Daily Aaj Flag Hosting Ceremony on 14 August 2015 in Islamia College, Peshawar. 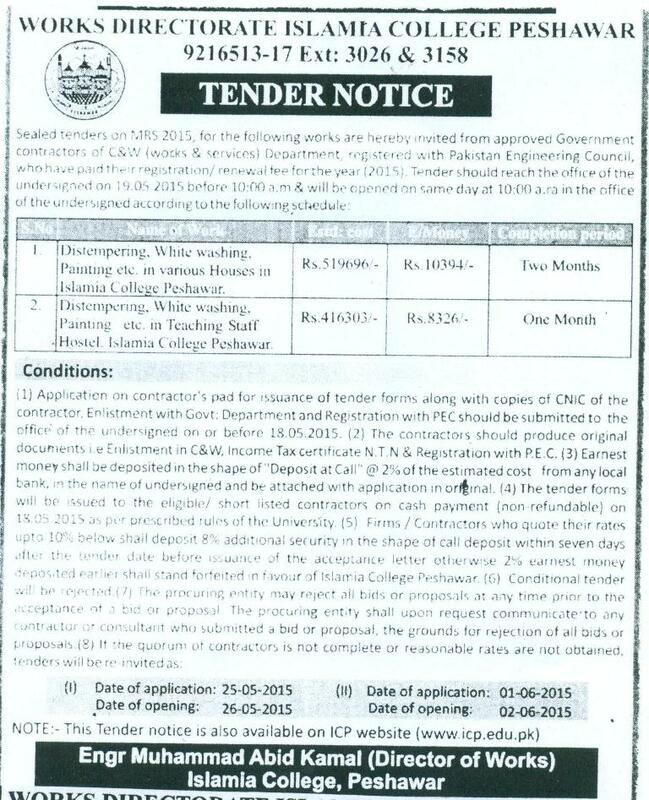 16-08-2015 Daily Aaj BS Admission open in Islamia College, Peshawar. 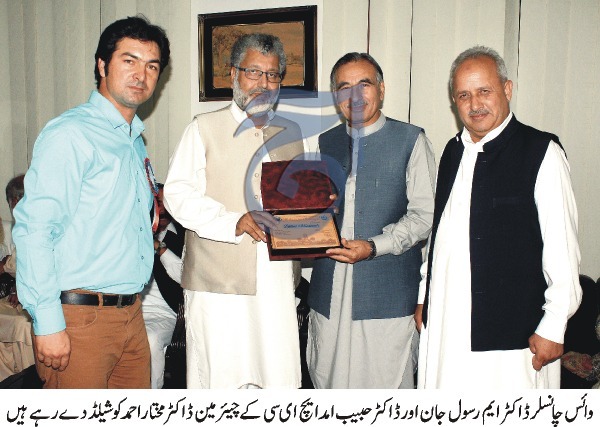 09-08-2015 Daily Aaj Mr. Aamir Izhar and Mr. Irfan Marwat were elected for Senate membership. 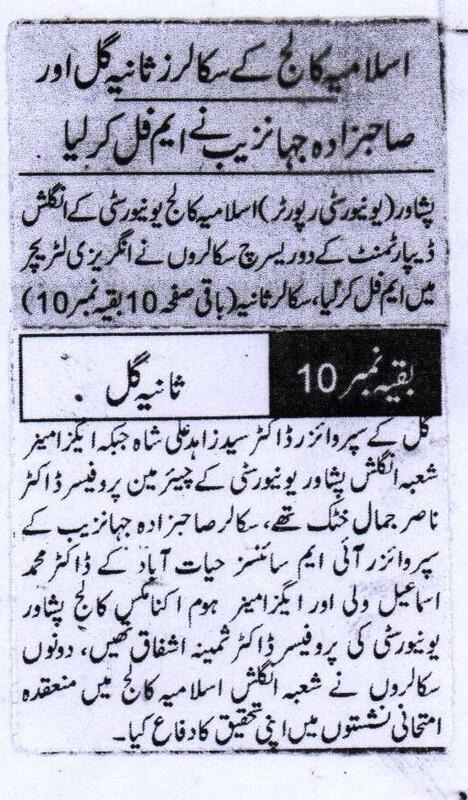 03-08-2015 Daily Mashriq Athletics trials for admission on sports quota in Islamia College, Peshawar. 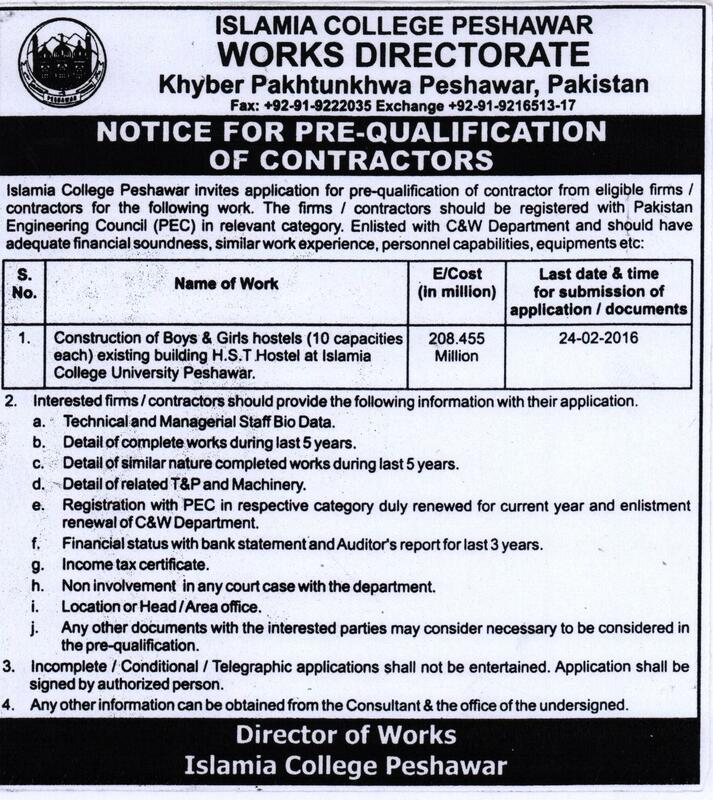 01-08-2015 Daily Aaj Two Mega projects will start working in Islamia College, Peshawar. 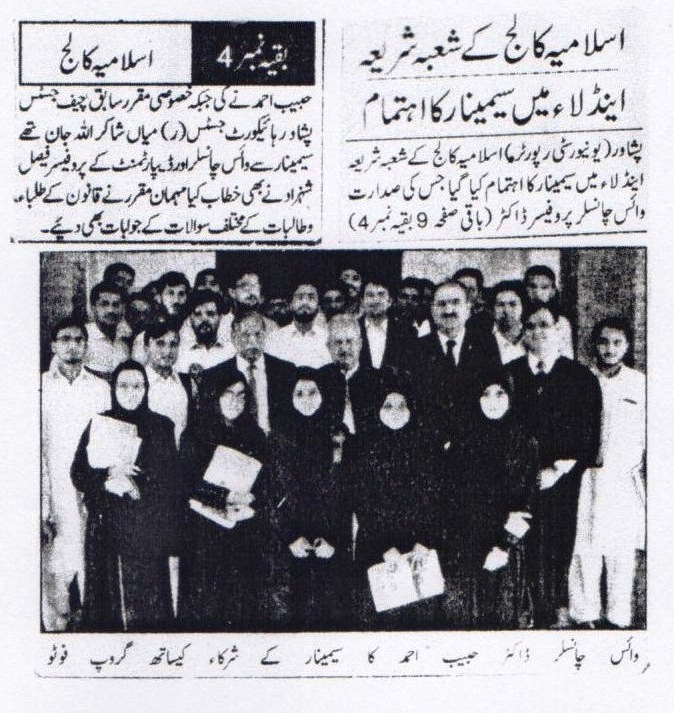 01-08-2015 Daily Mashriq Two class-IV employee of Islamia college, Peshawar have been successful in the draw Umrah. 28-07-2015 Daily Aaj All arrangement has finalized for M.A / B.Ed Annual Examination 2015. 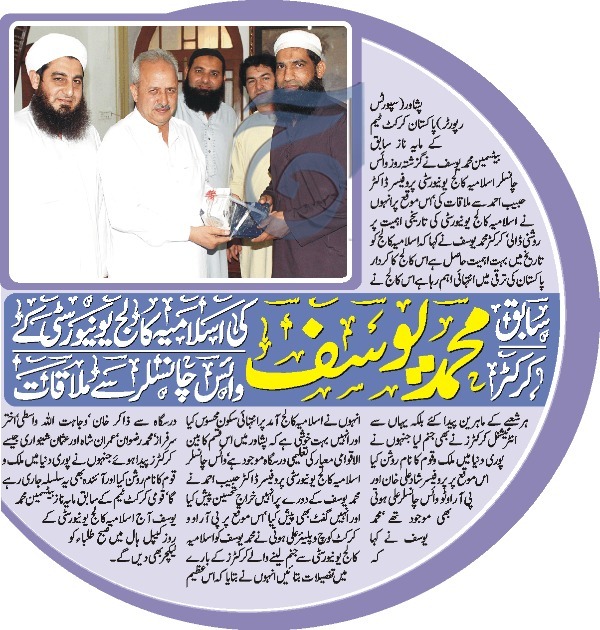 09-07-2015 Daily Aaj Appointment of PRO in Islamia College, Peshawar. 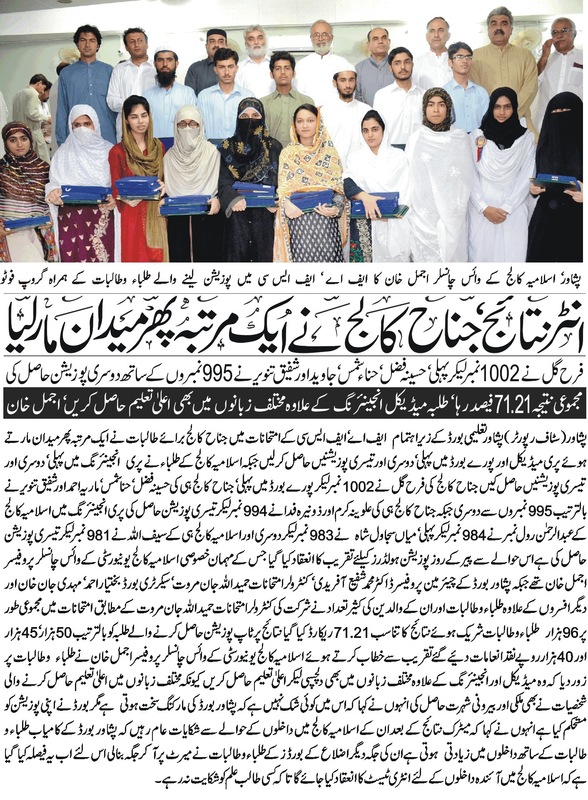 08-07-2015 Daily Aaj Hafiz e Quran Test conducted for admission F.A/F.Sc 2015 at Islamia College, Peshawar. 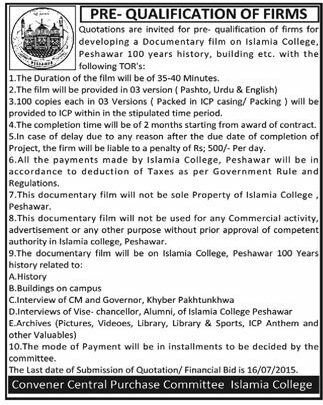 30-06-2015 Daily Aaj Pre-Qualification of Firms for developing documentary film on Islamia College, Peshawar.